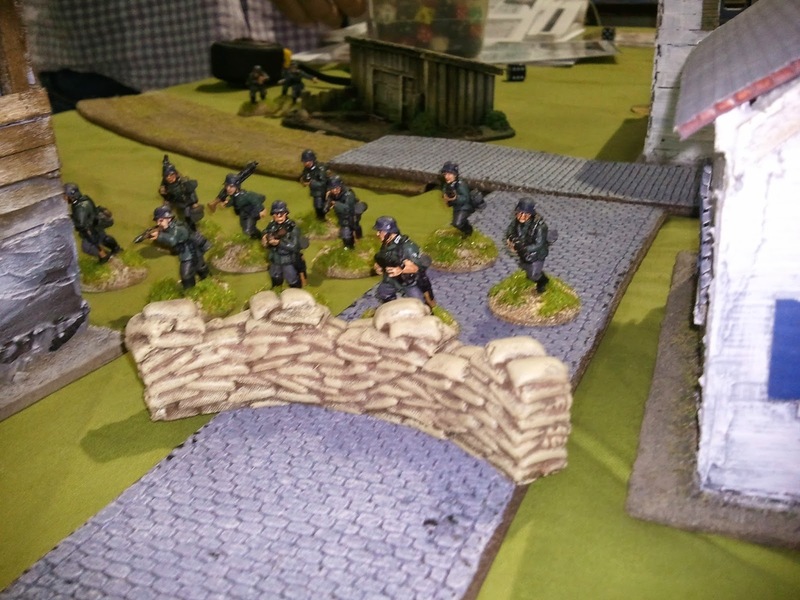 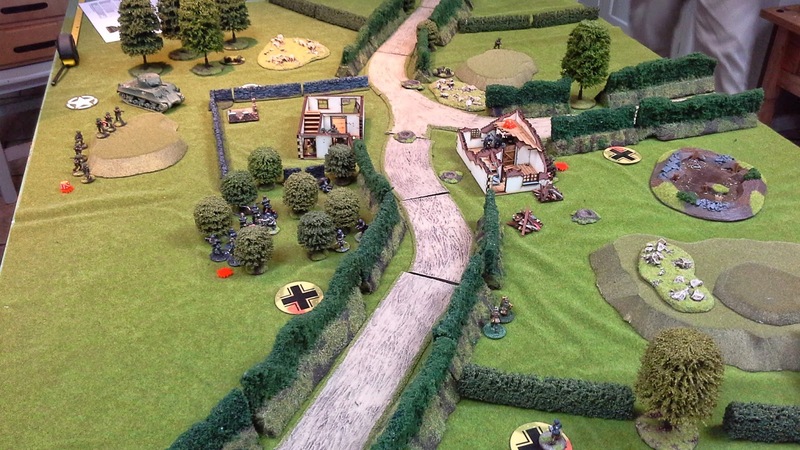 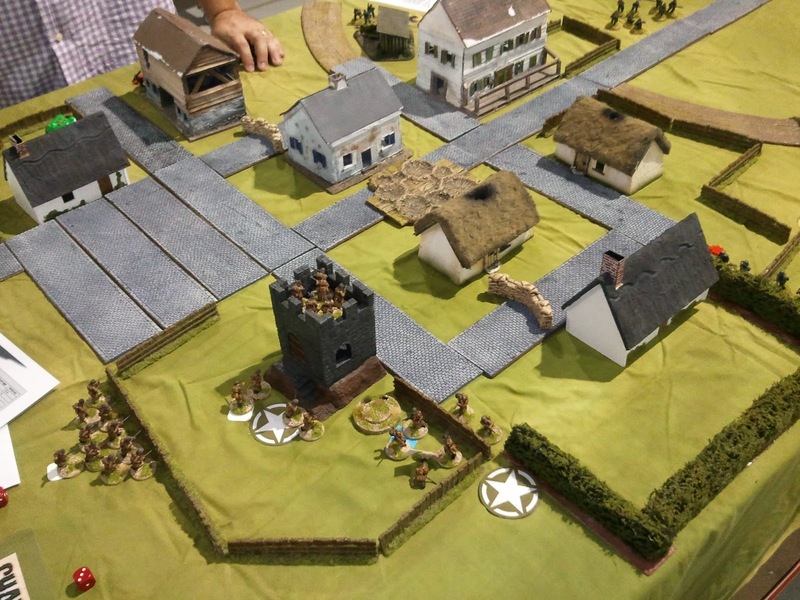 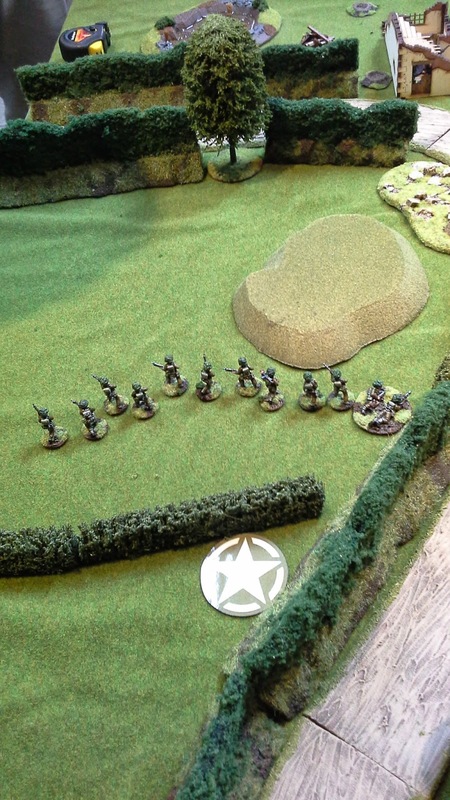 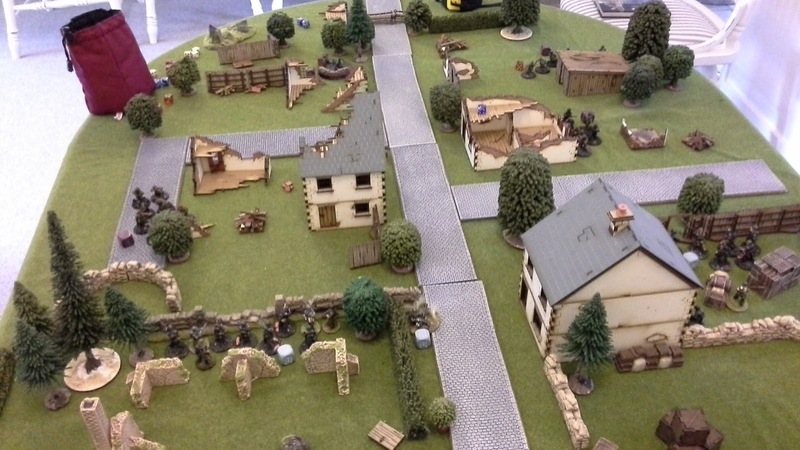 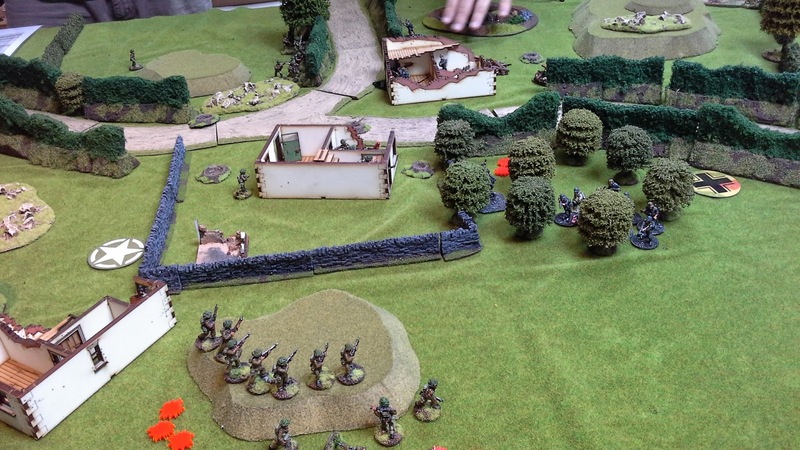 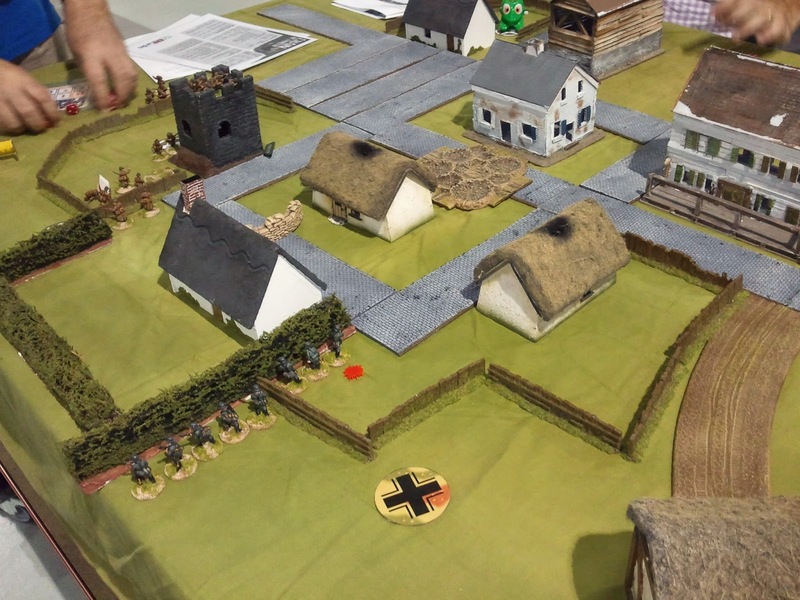 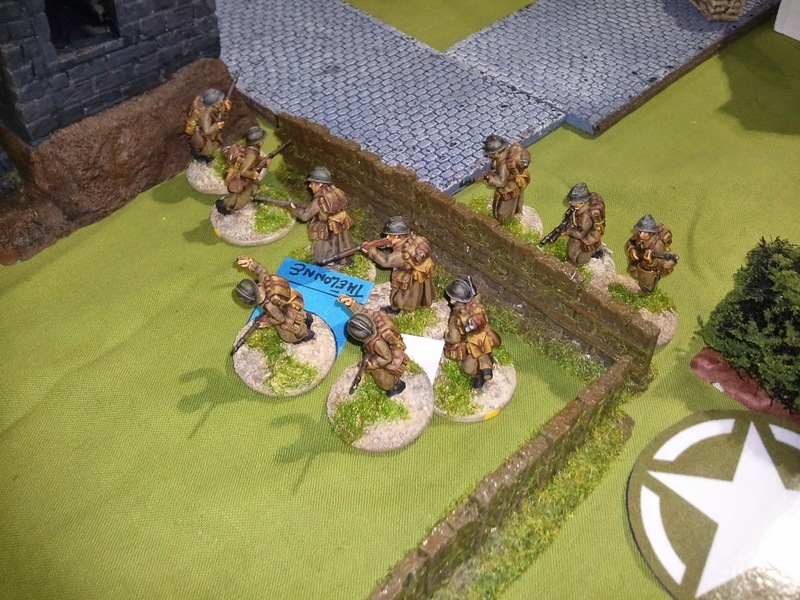 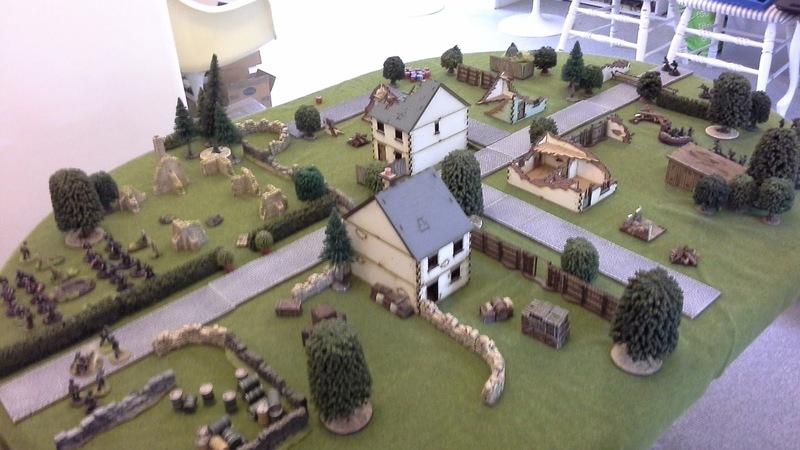 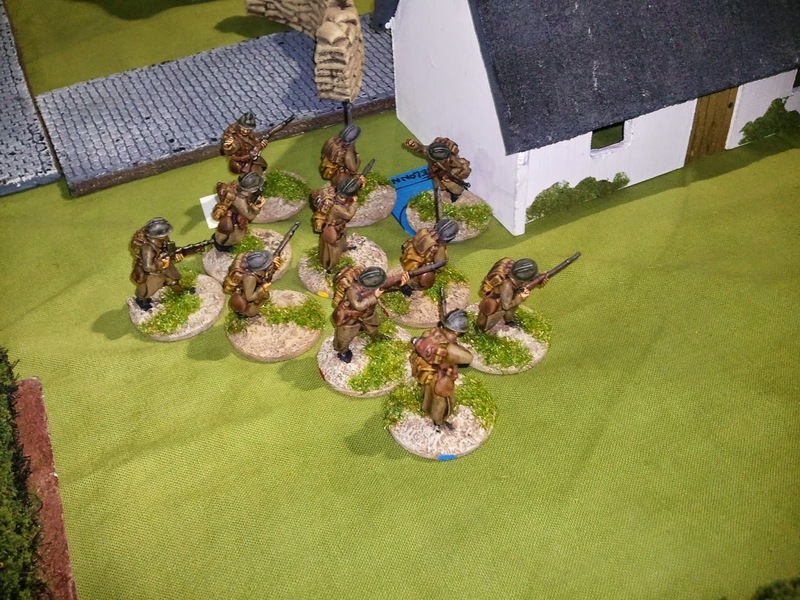 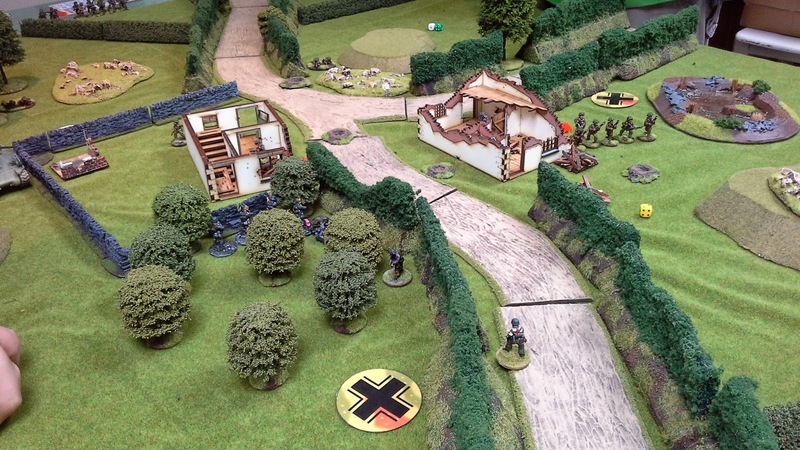 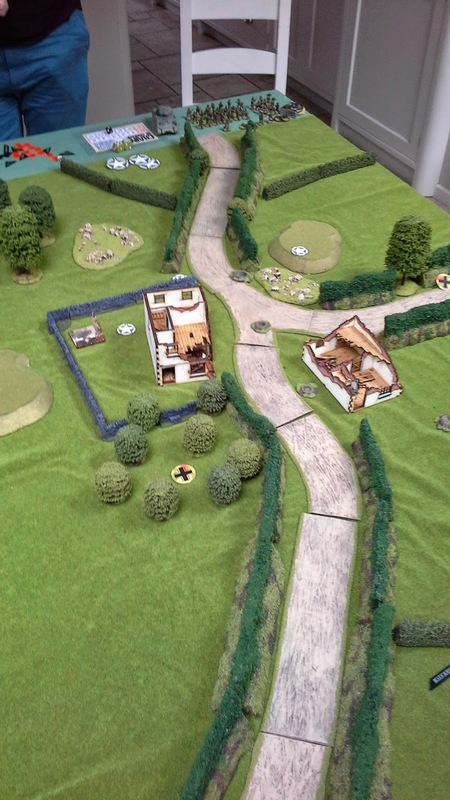 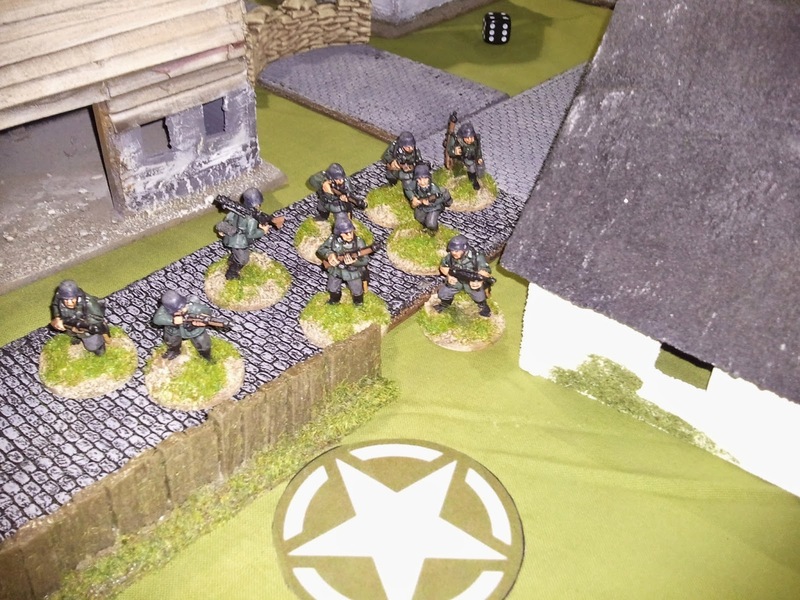 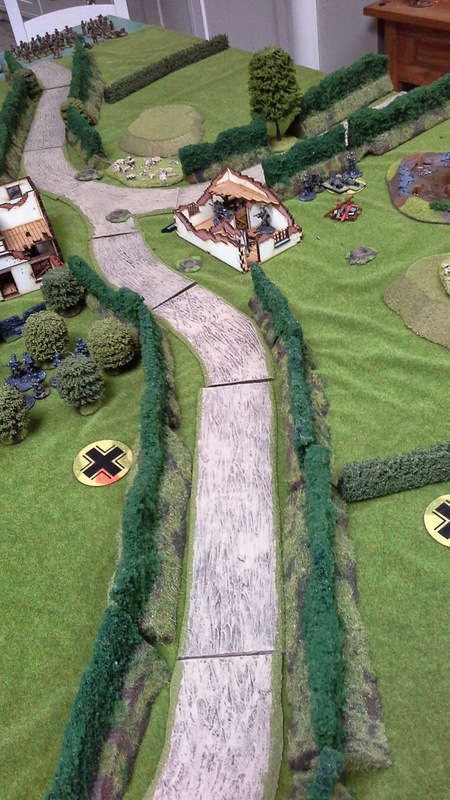 We played a smaller game last night with the German looking to push back the French reconnaissance patrol. 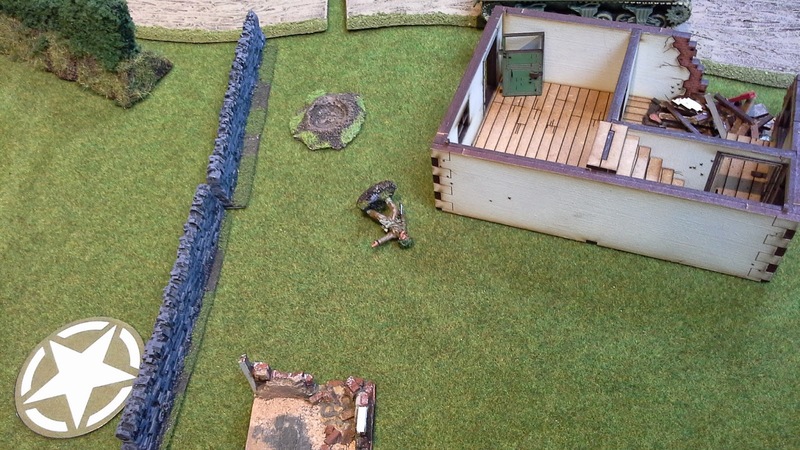 This was difficult for the Germans as they only had one anti tank weapon. The mortar they had only had HE so was not fired once. 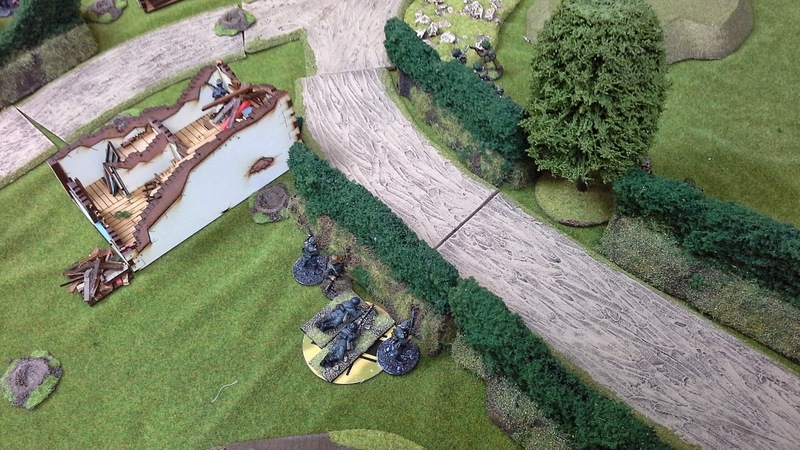 The French armored cars had to wait to withdraw until a third car caught up with them. 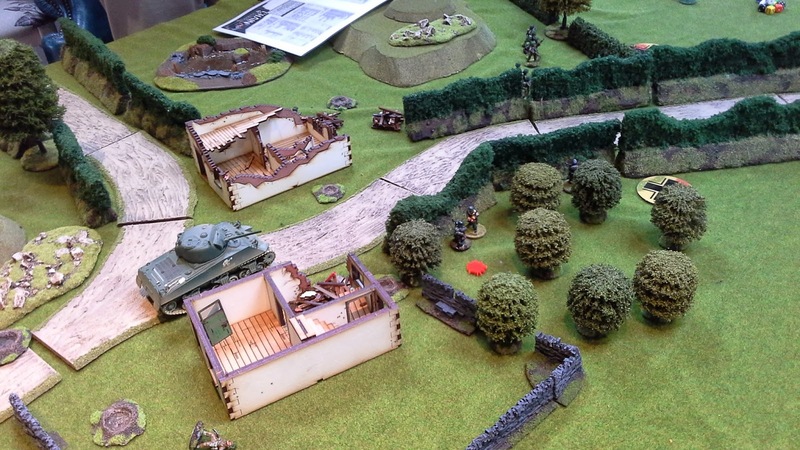 The Germans tried to maneuver froward and knock out a car via either machine guns (mostly ineffective but do stop them firing/moving) and use of the antitank weapon. 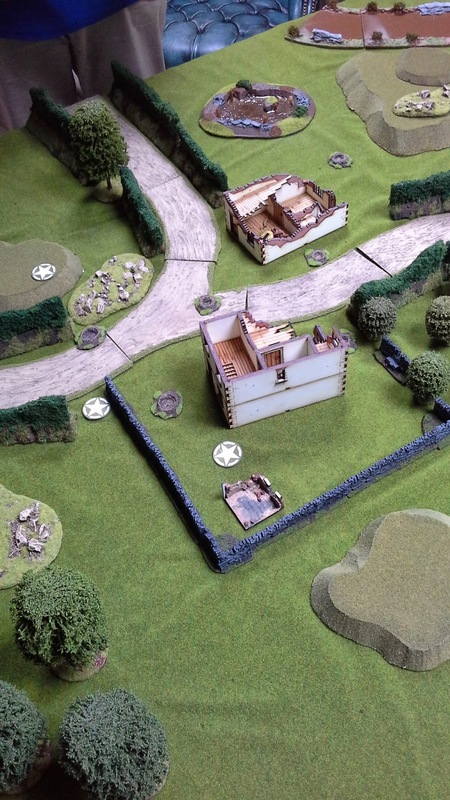 On the last turn before the French withdraw intact a HMG forced the last remaining armored car to panic, withdrawing by 2". 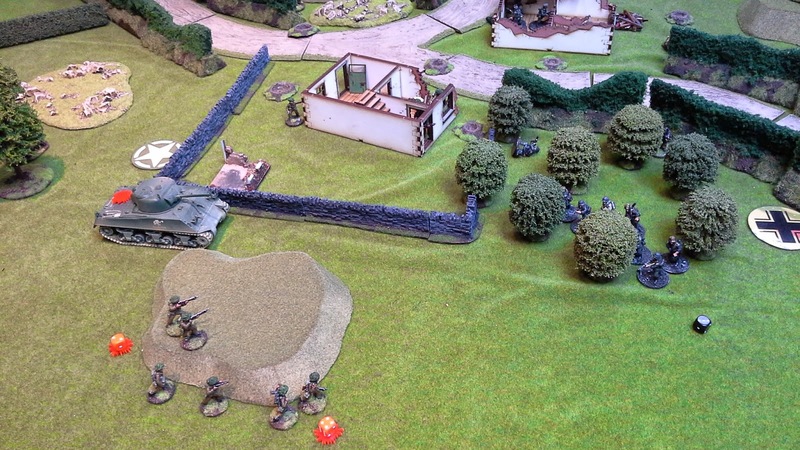 This then put it square in the sites of the antitank weapon. 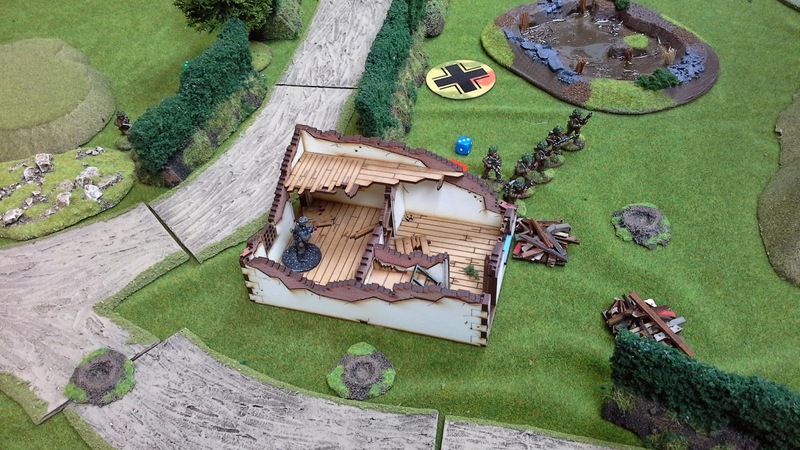 The result the car was immobilized resulting in a German win. 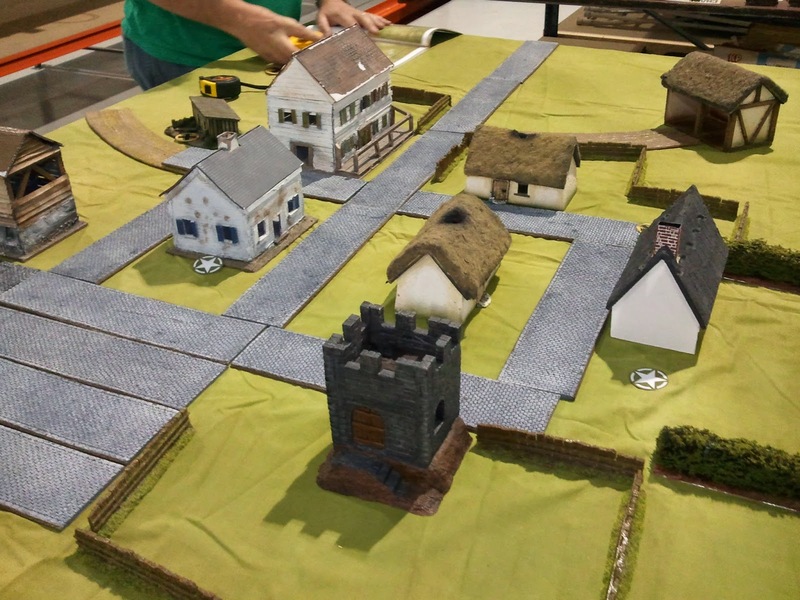 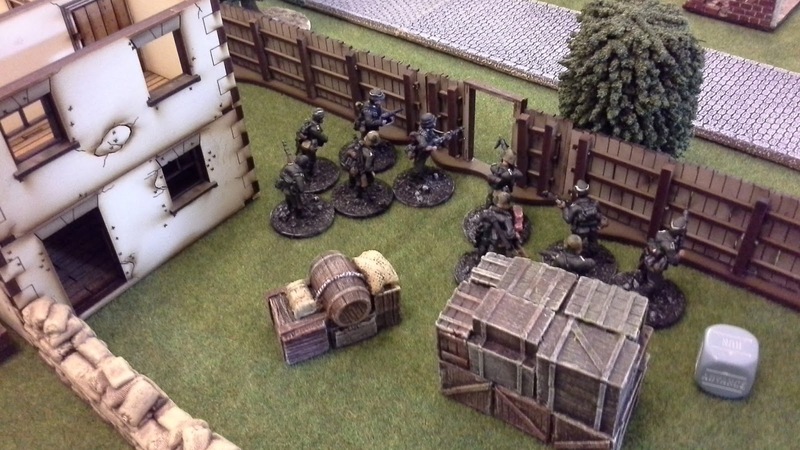 All figures and terrain supplied by Chris, building are nice cardboard and foam card creations. 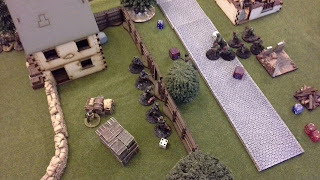 A close up of the Germans vs 2 armored car, just about to wipe out the French MG (In the building) section pinning them down. 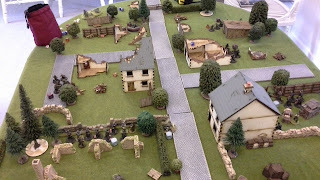 Chain of Command - "Battle of Chateau le Bramford"
More Chain of Command, this time played over at Andrews. 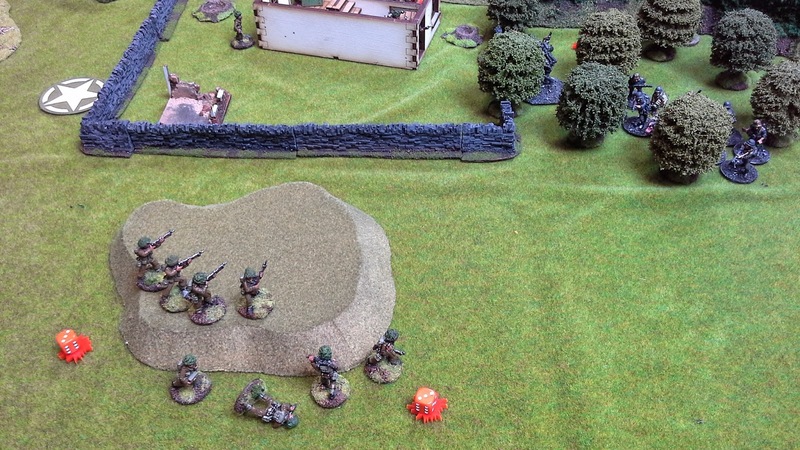 Chris and I took the Germans, Andrew and Robafett the plucky British. 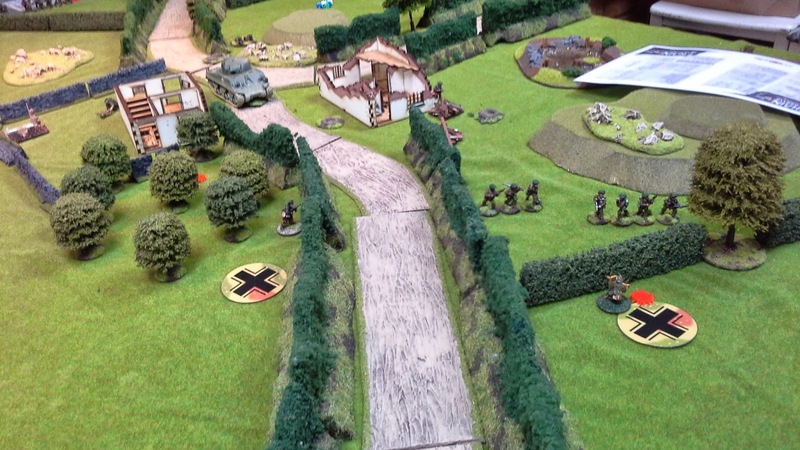 The Germans are playing a delaying action against the British. 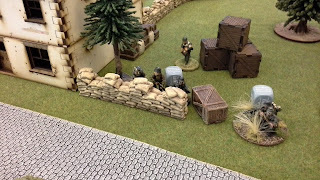 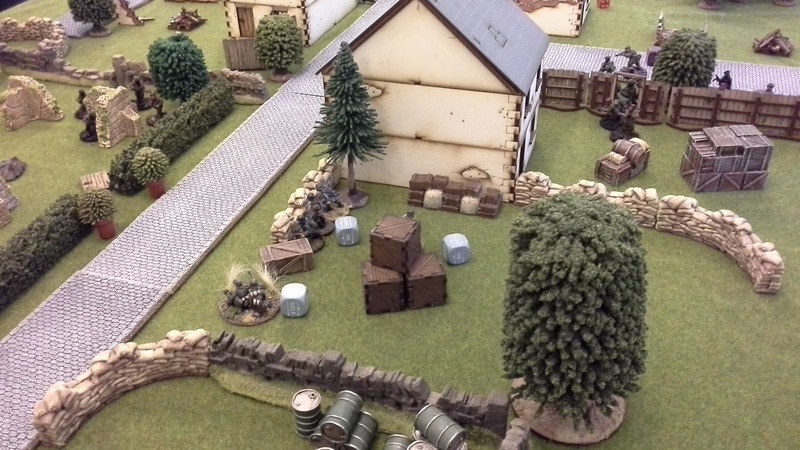 The Germans moved up to take defensive positions. The first squad headed for the larger of the two ruined houses but could only get as far as the dense cover of the forest nearby. 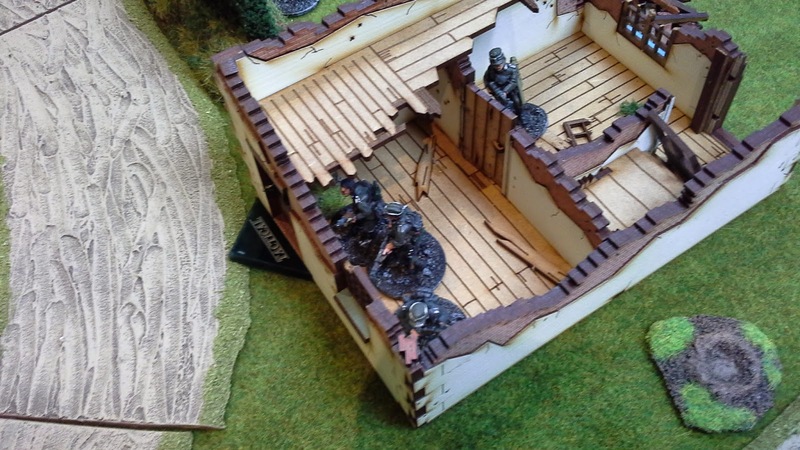 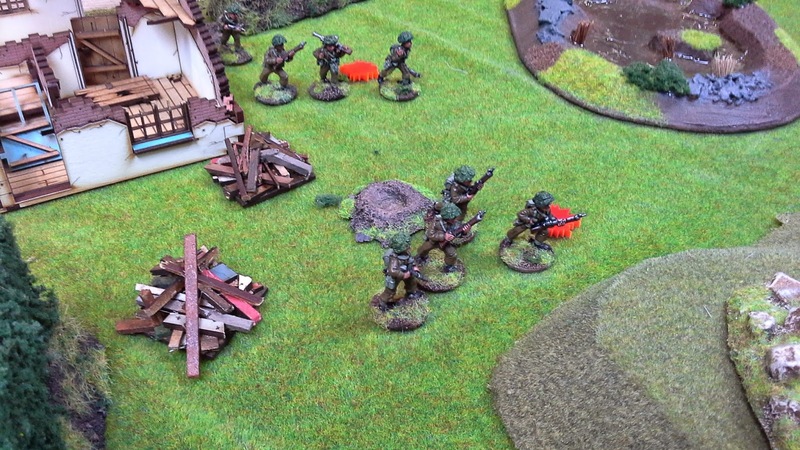 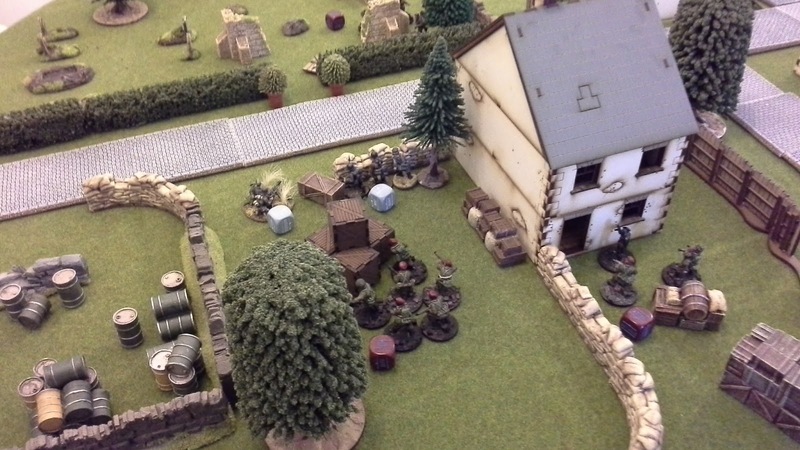 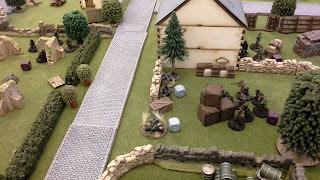 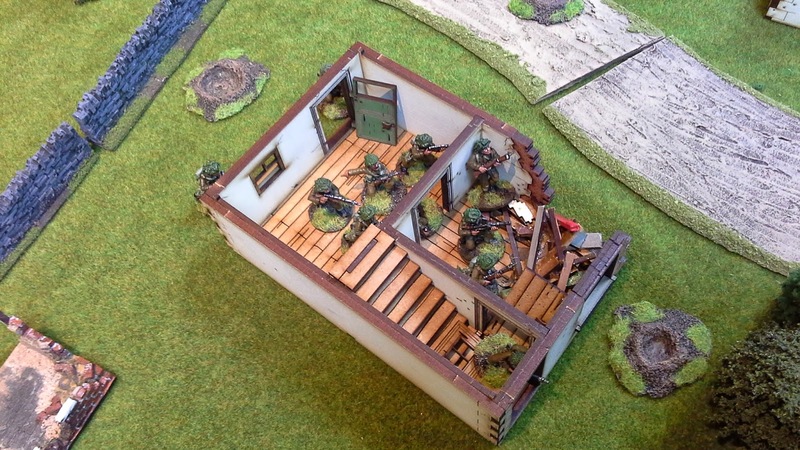 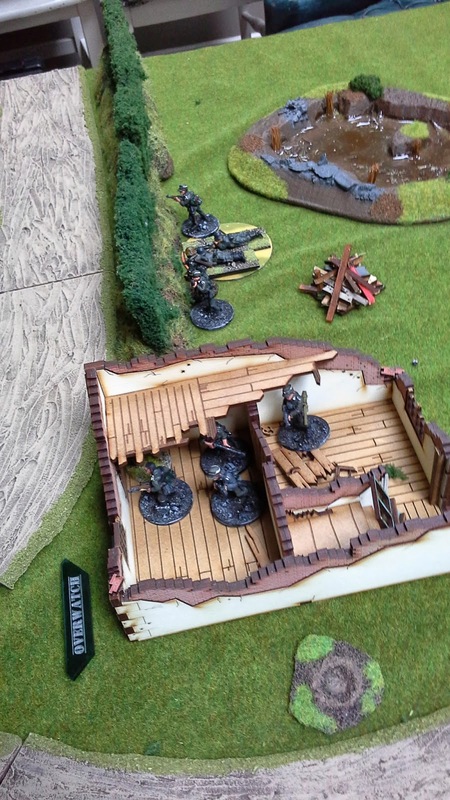 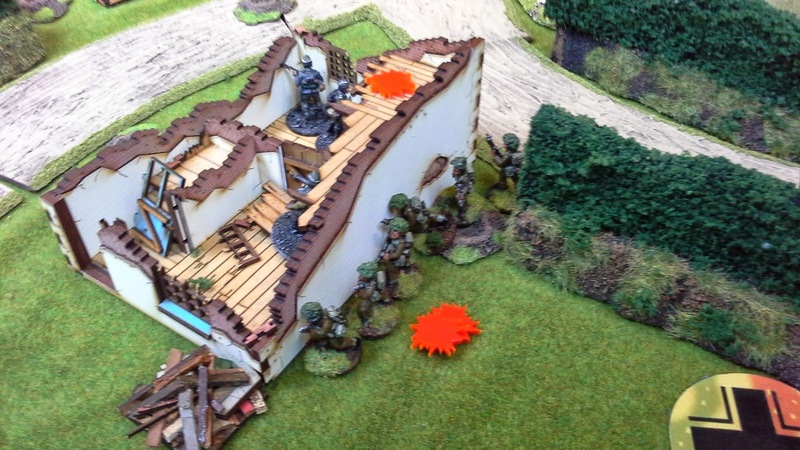 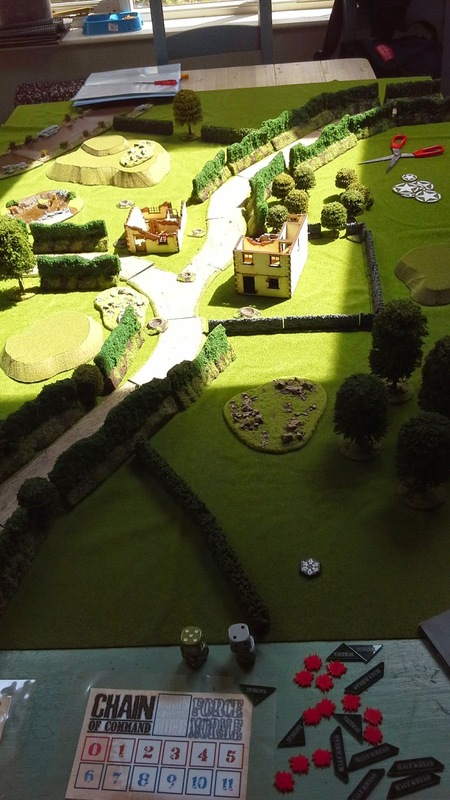 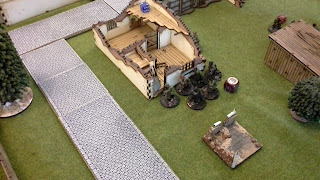 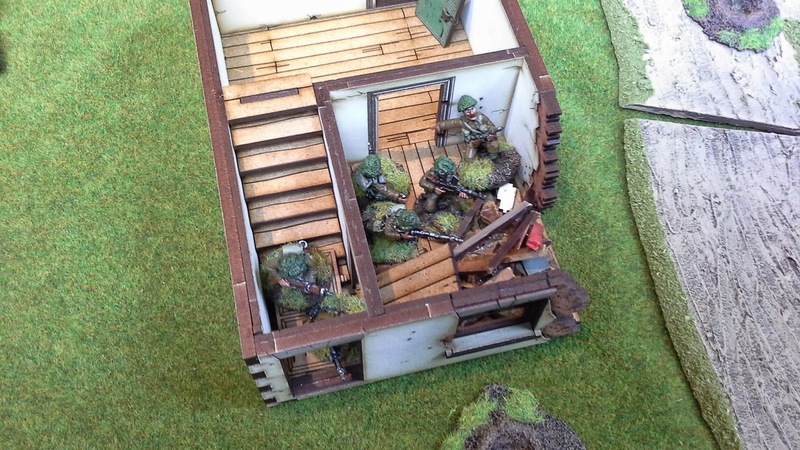 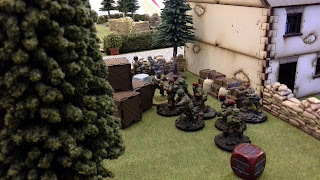 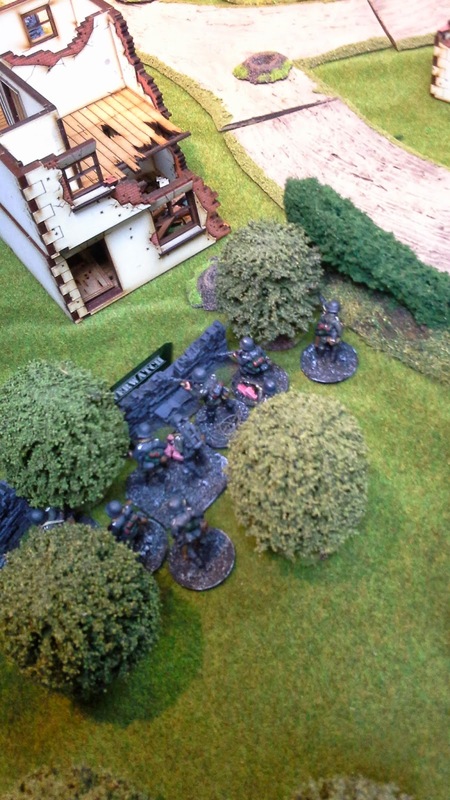 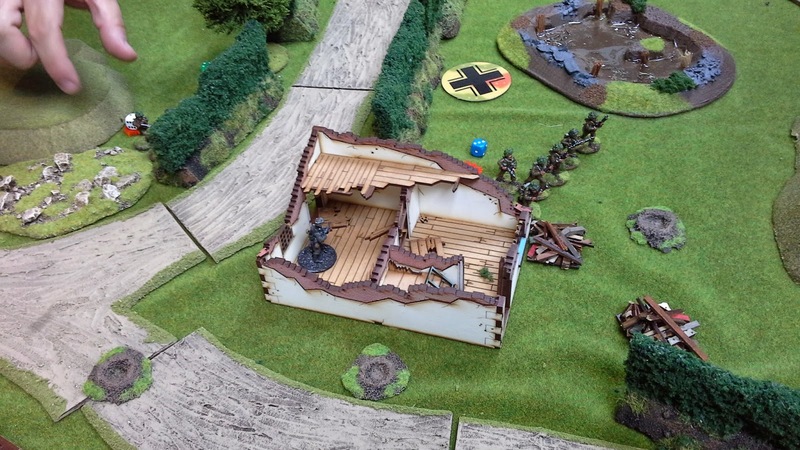 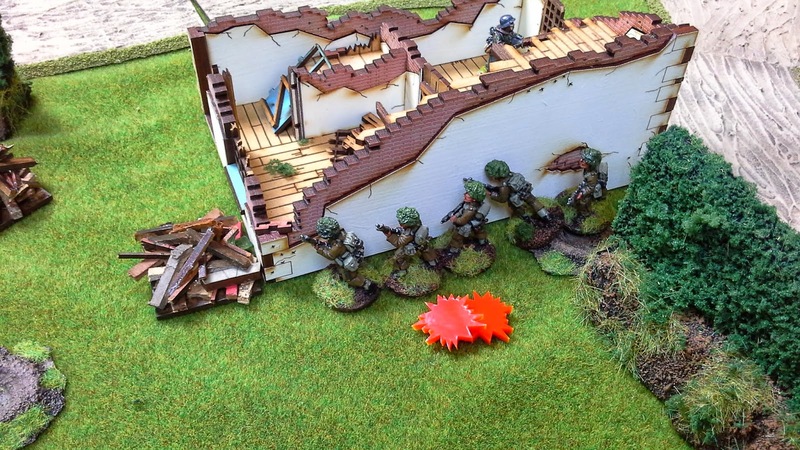 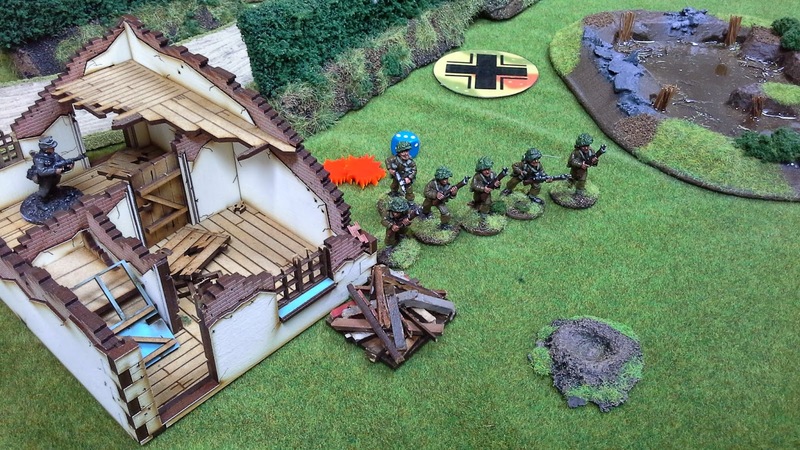 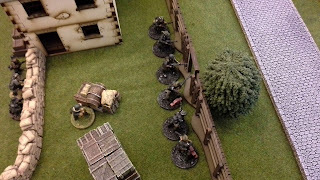 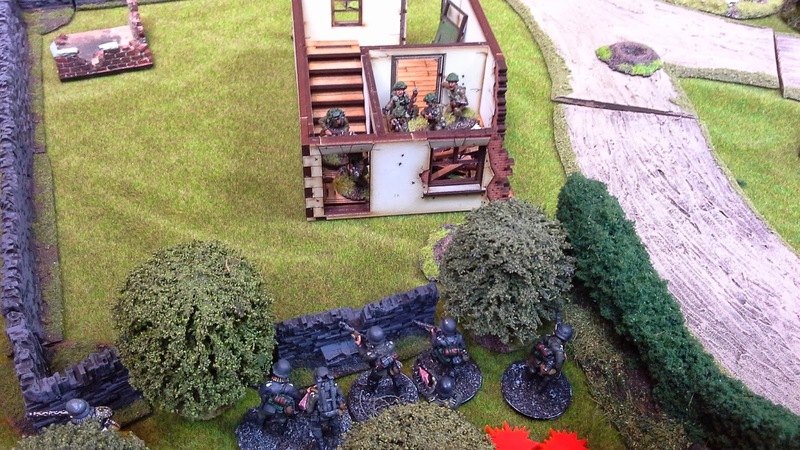 The second squad took cover in the smaller ruined farmhouse with part of the squad (with the MG) set up along the bocage. 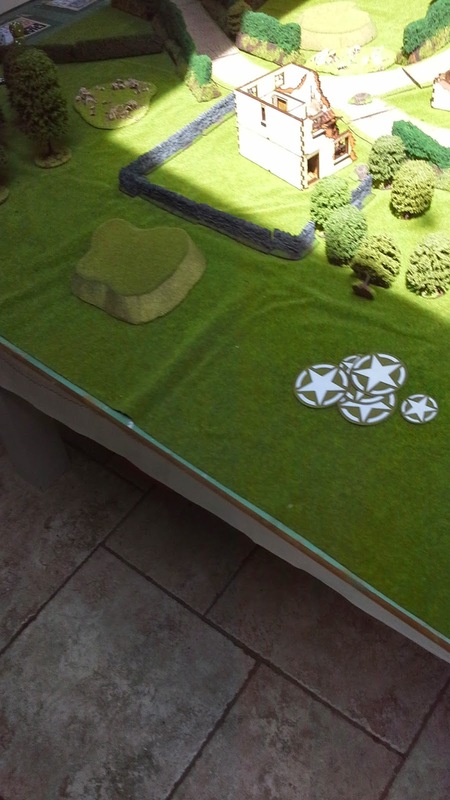 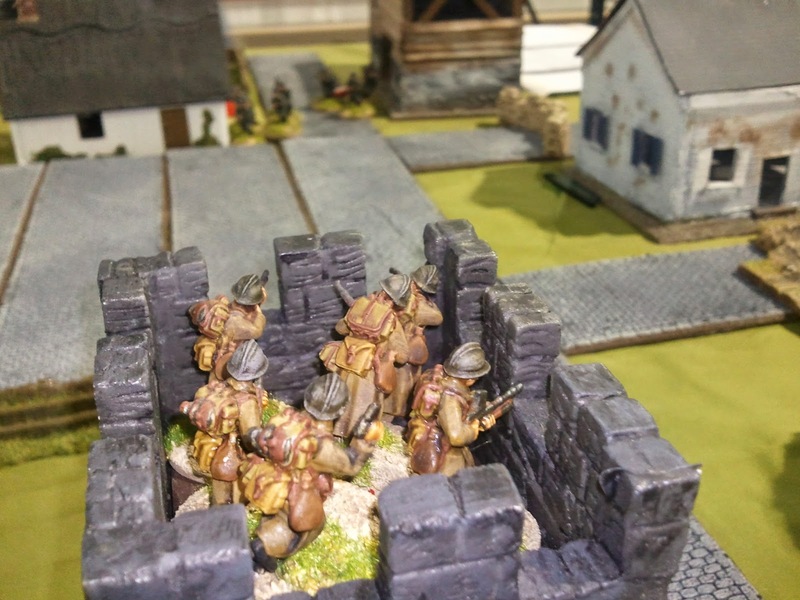 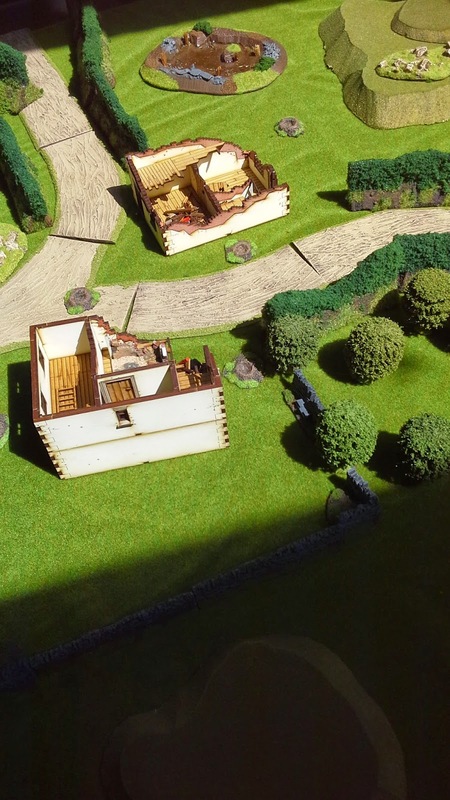 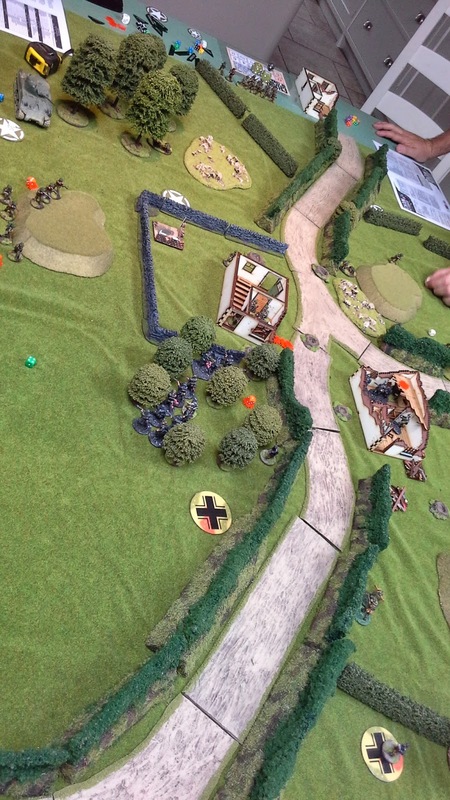 The British began their assault by moving one squad through the fields to their left flank and a second squad holed up in the farmhouse ruin to their right flank - just beating a German squad there! 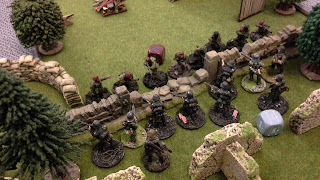 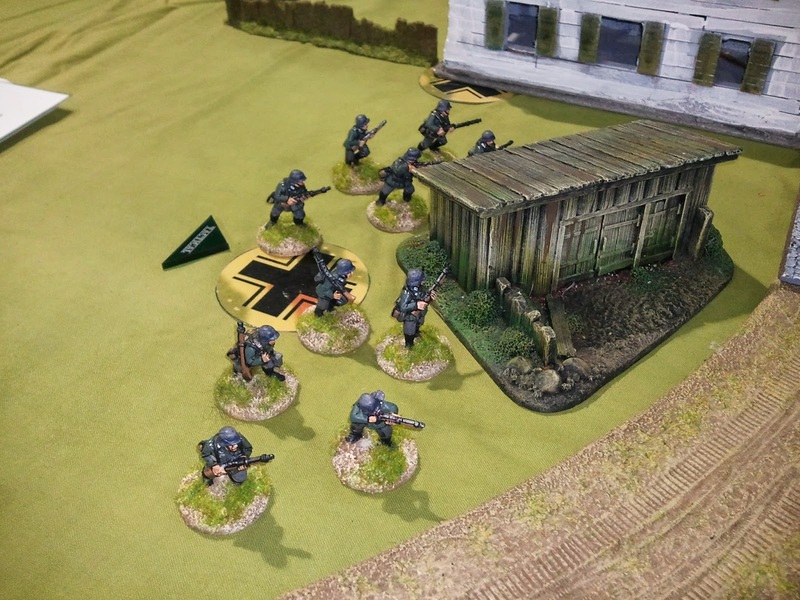 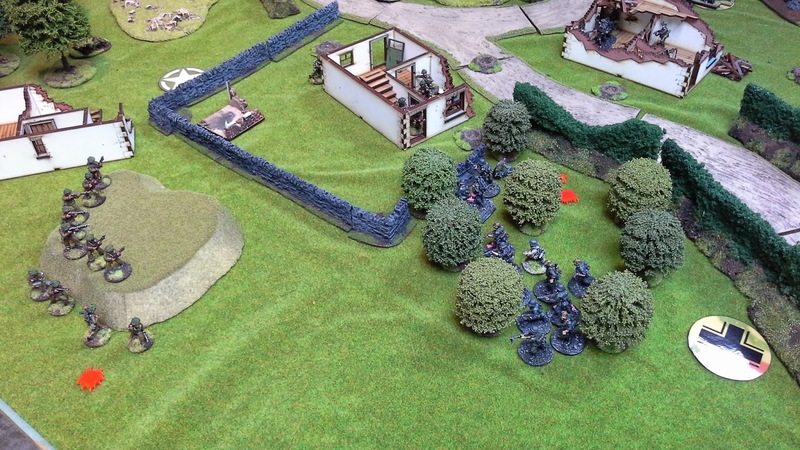 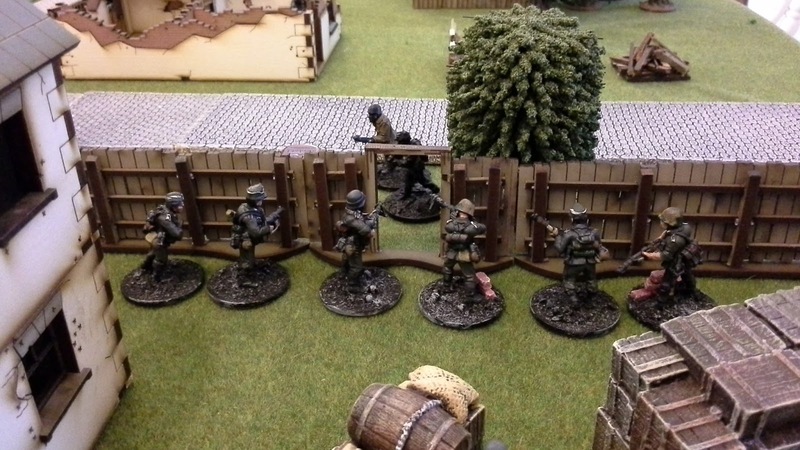 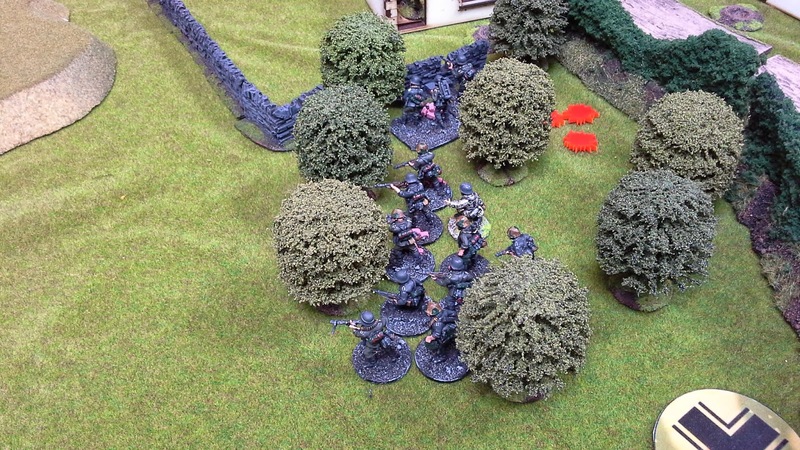 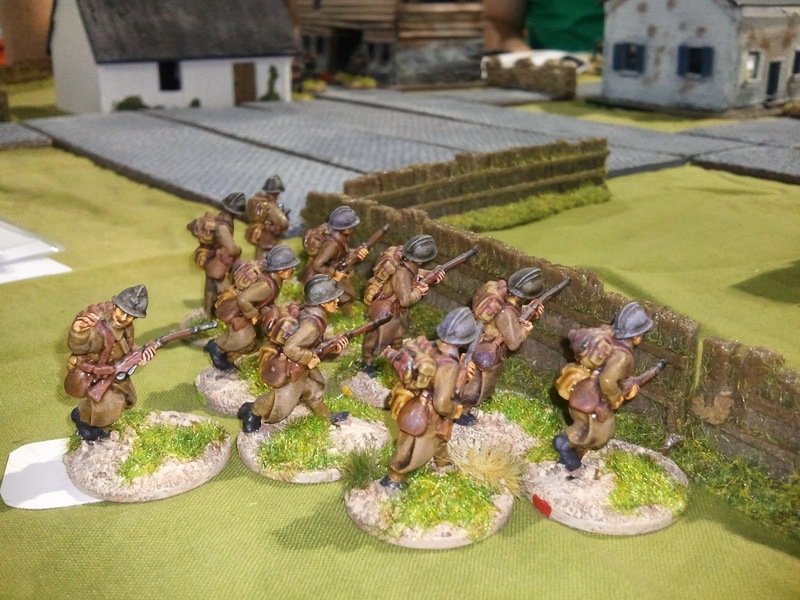 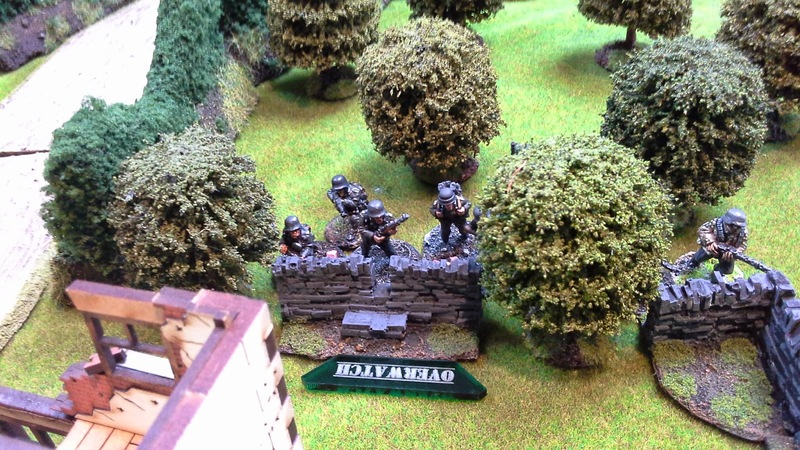 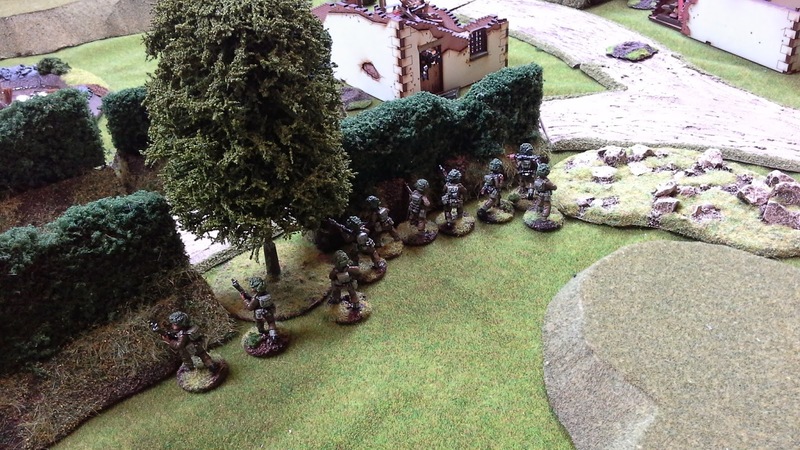 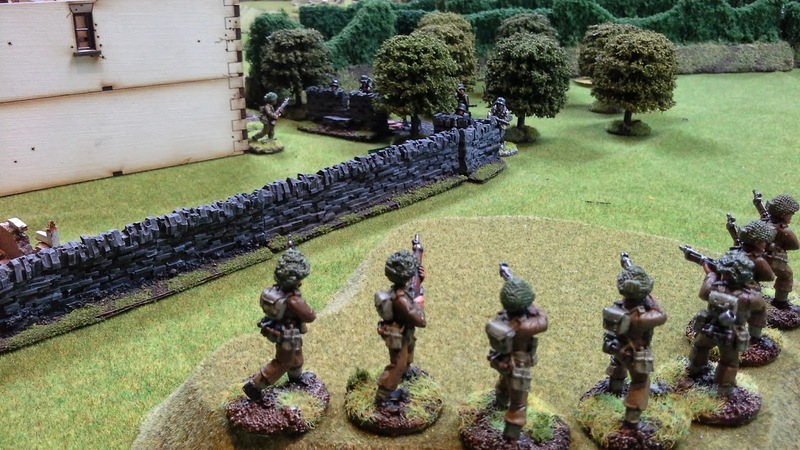 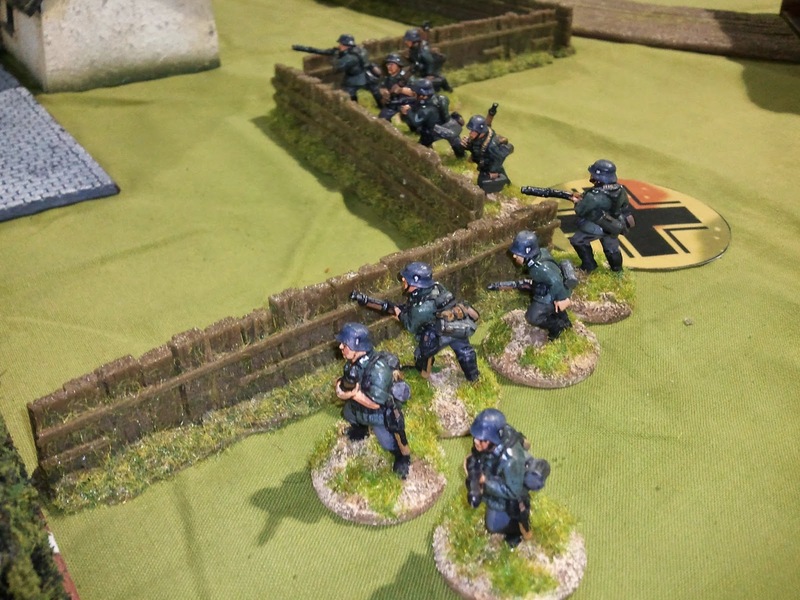 The German squad in the forest moved forward to take up firing positions by a wall surrounding the farmhouse. 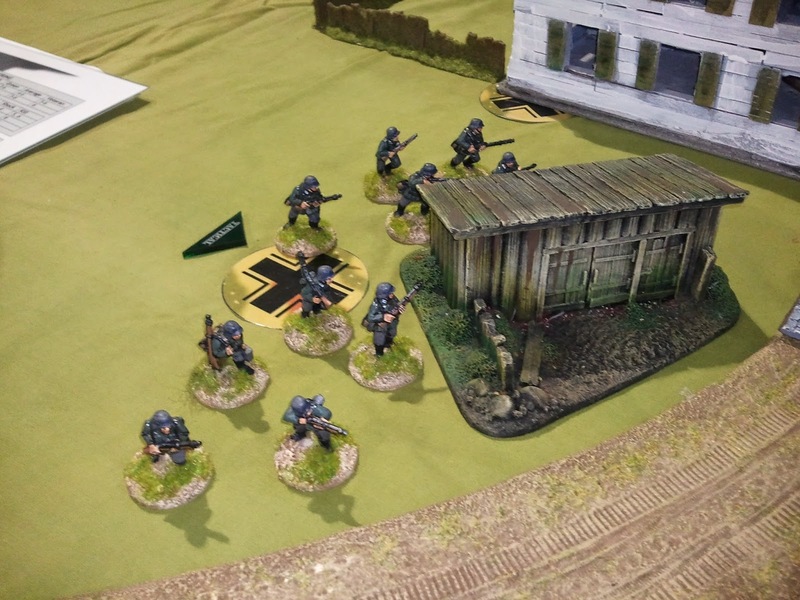 The German first squad prepared themselves for the attack. 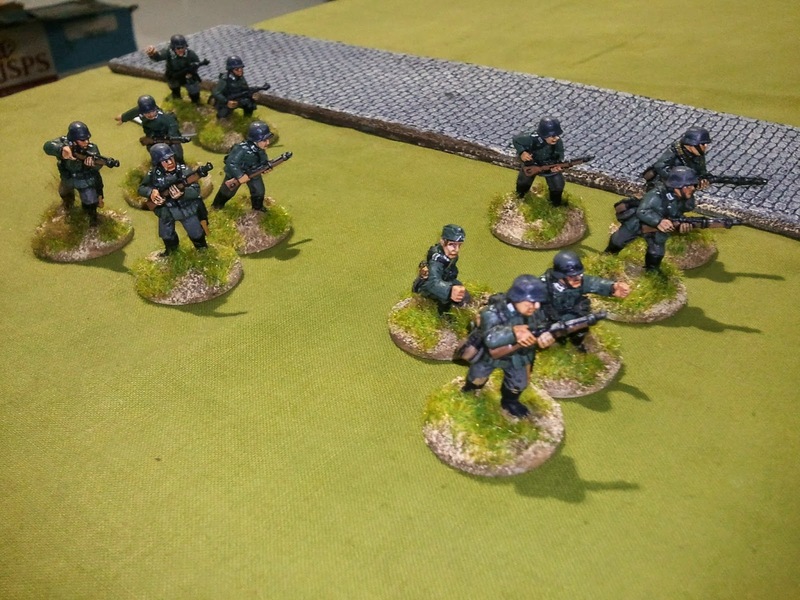 While their first squad continues to move forward. 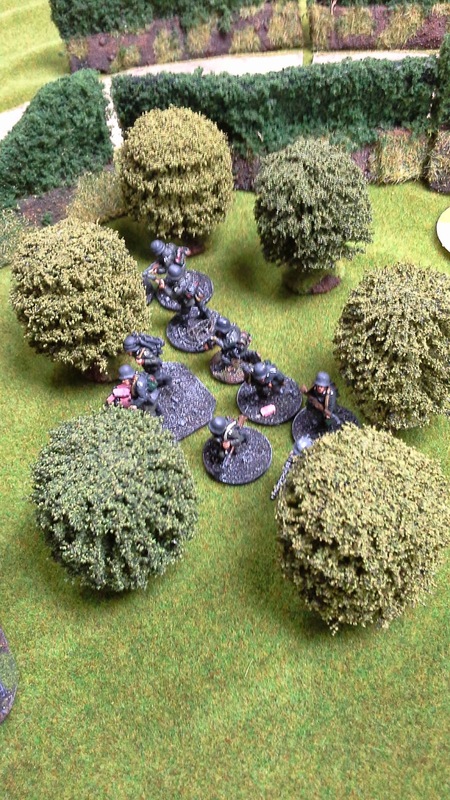 The third British squad makes its entrance over a low lying hill on their far right flank - adding to the fire-power aimed at the Germans in the forest. 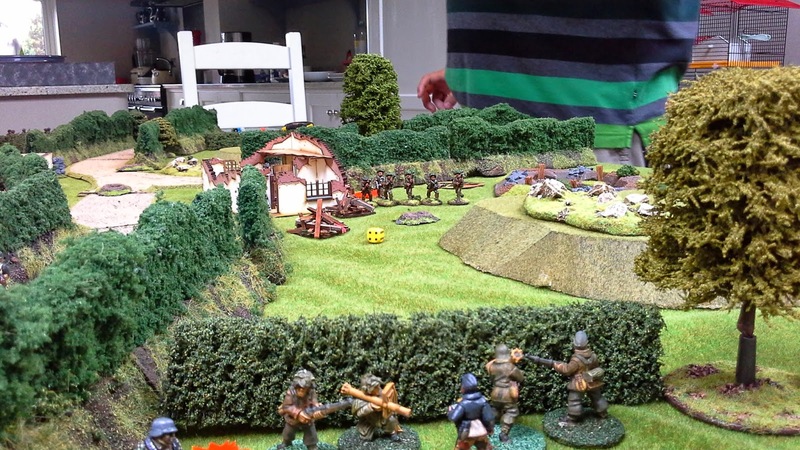 Shots ring out and battle rages across the hill, the farmhouse and the forest! 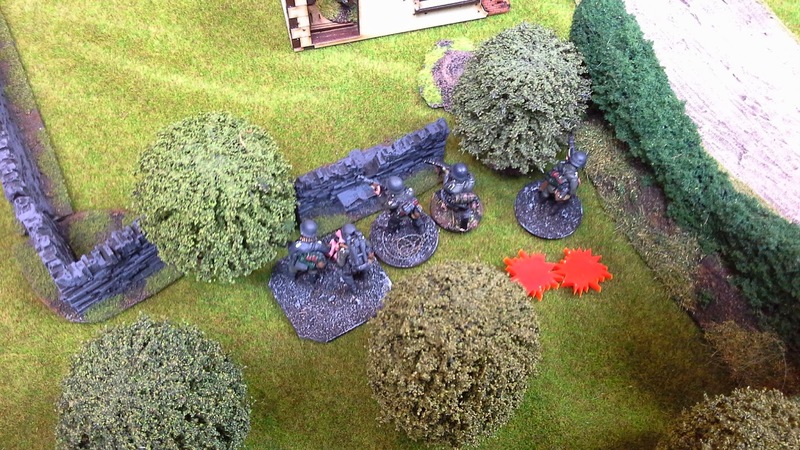 The Germans take several hits but manage to hold on under withering fire from the two British units. 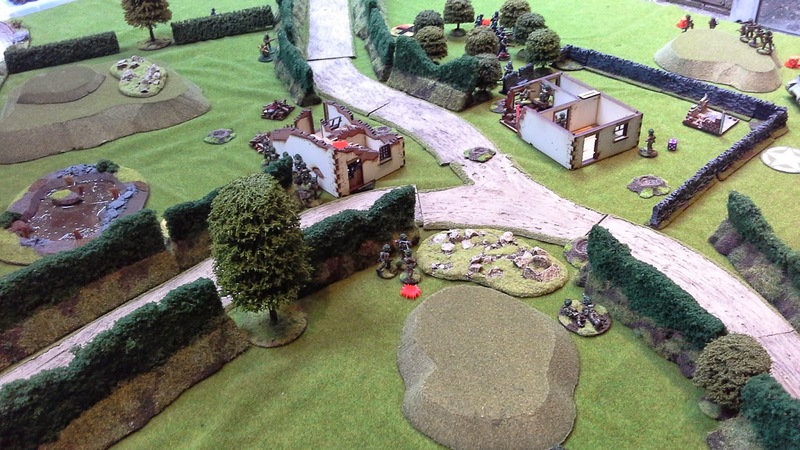 The first British squad has meanwhile reached the edge of the bocage opposite the Germans and a minor stalemate ensues. 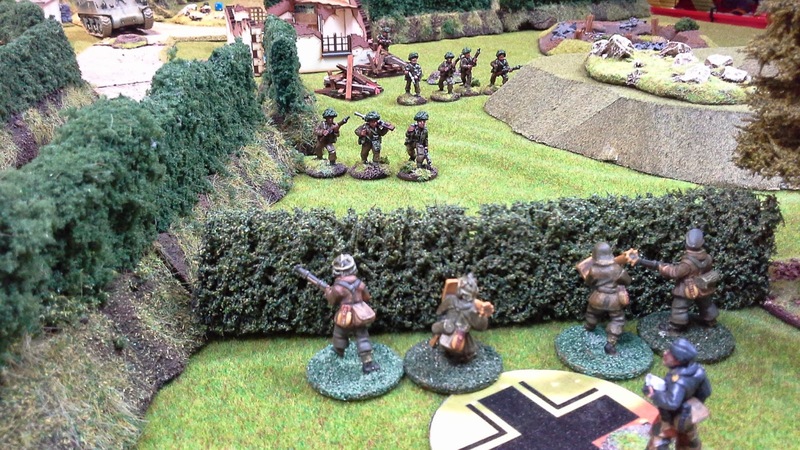 ...until they are joined by a third German squad! 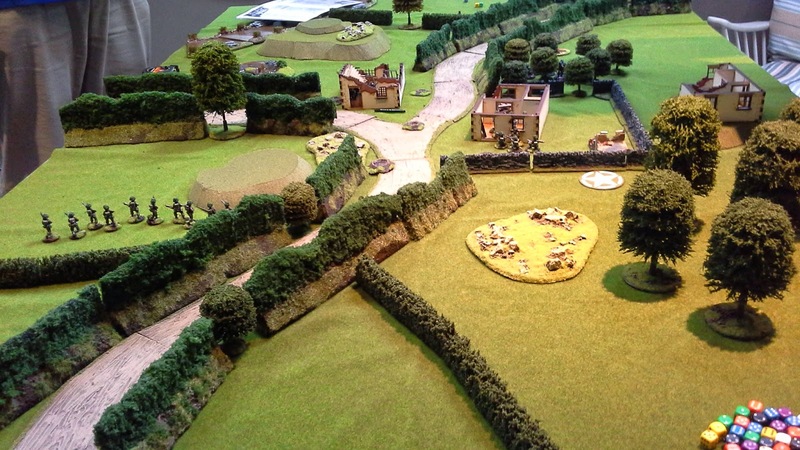 Now it is the British turn to endure heavy fire - the men on the low hill taking most of this. 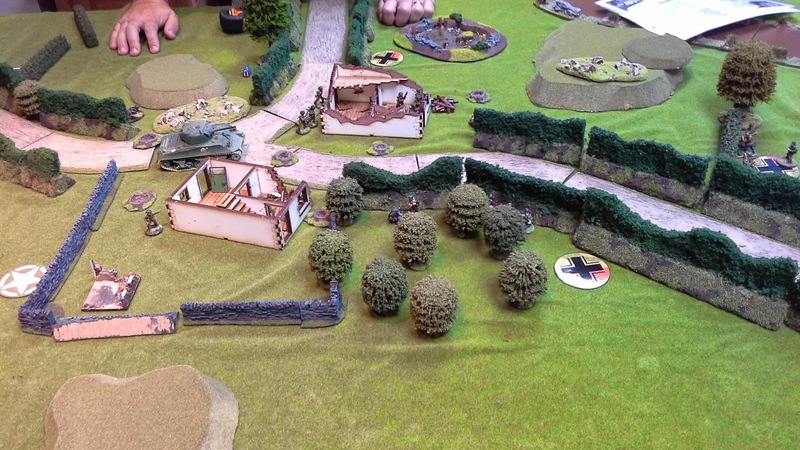 The British / German stalemate continues on the other side of the battlefield. 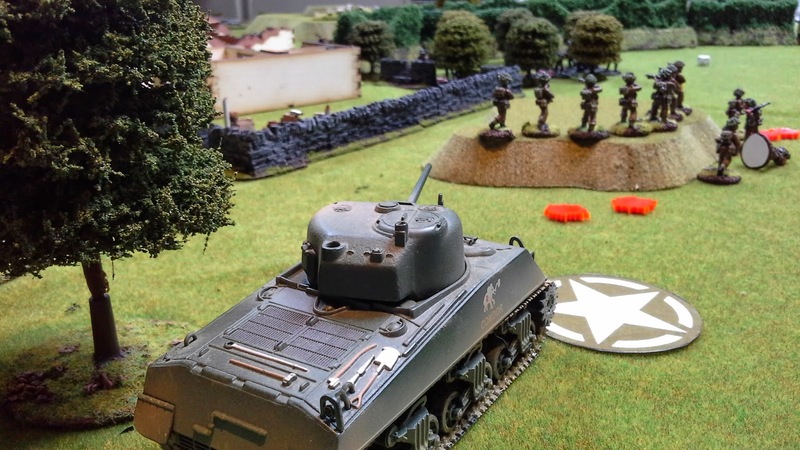 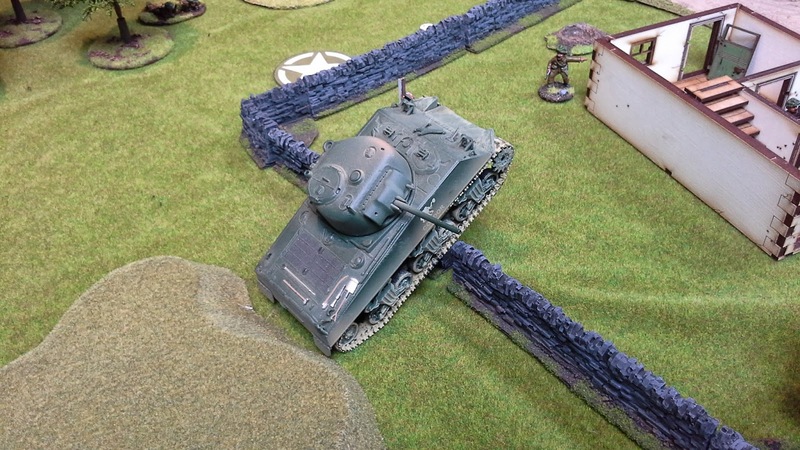 Captain Robertson decides it is time to bring in the heavy guns and their Sherman rumbles onto the field! 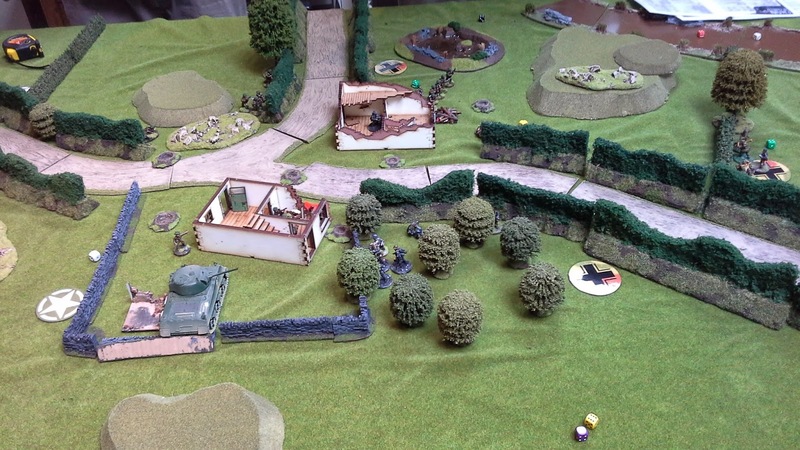 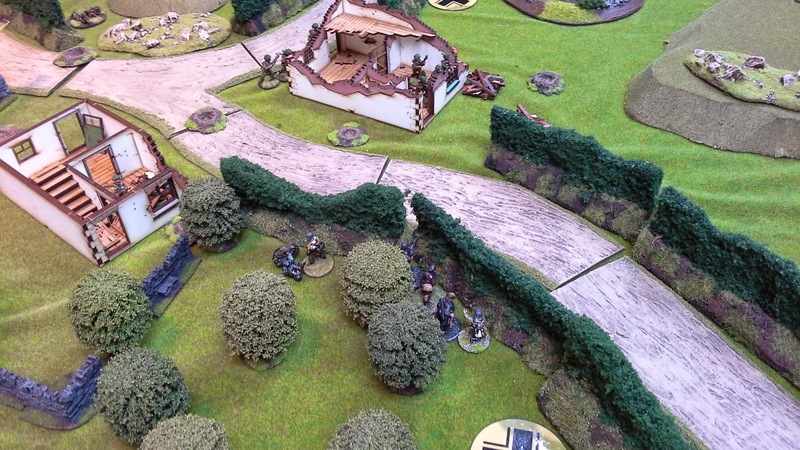 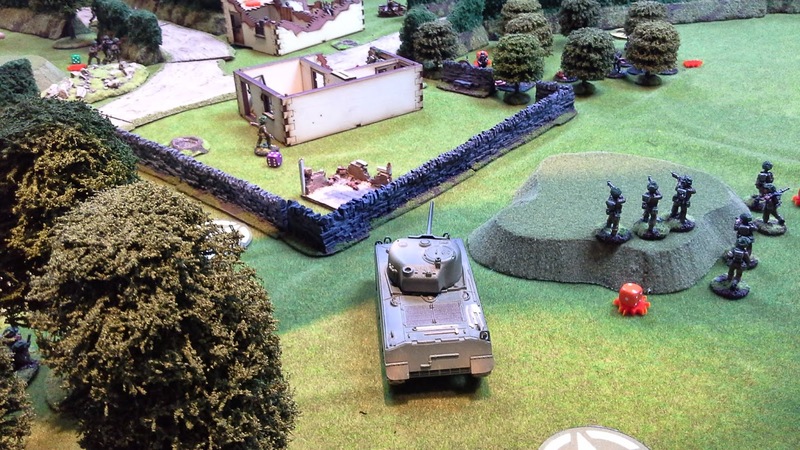 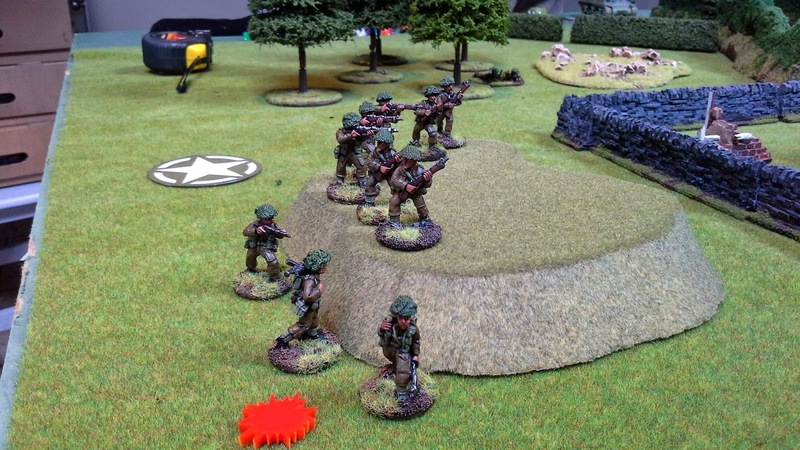 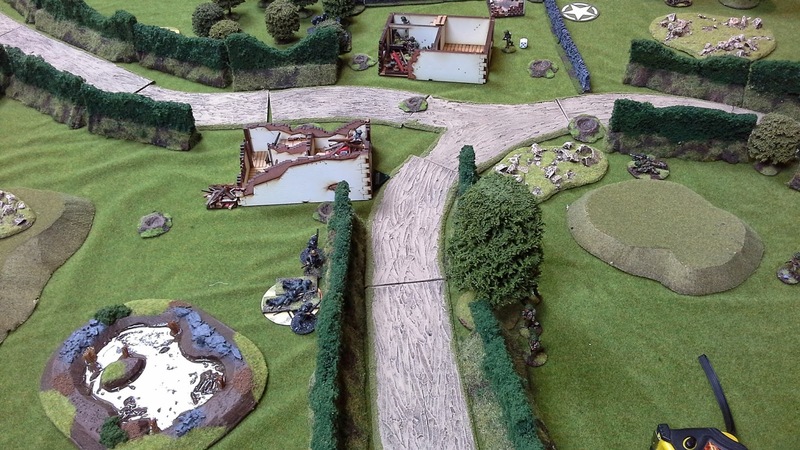 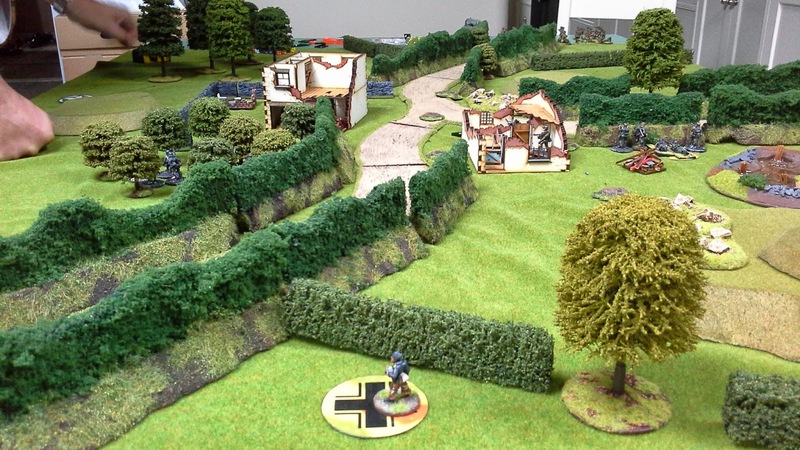 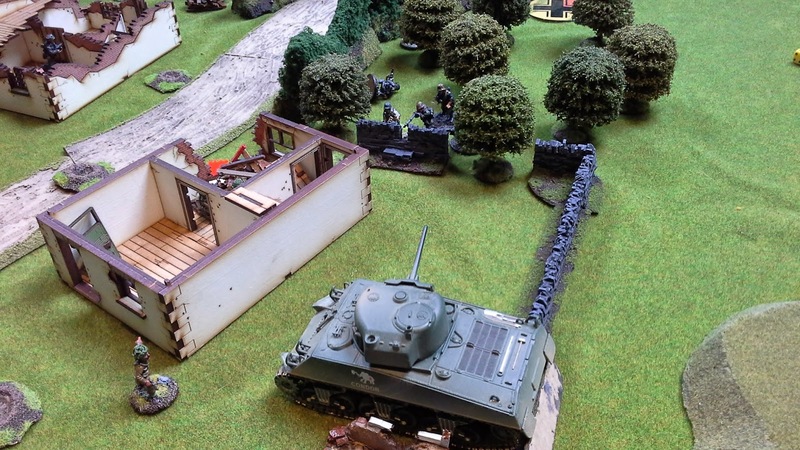 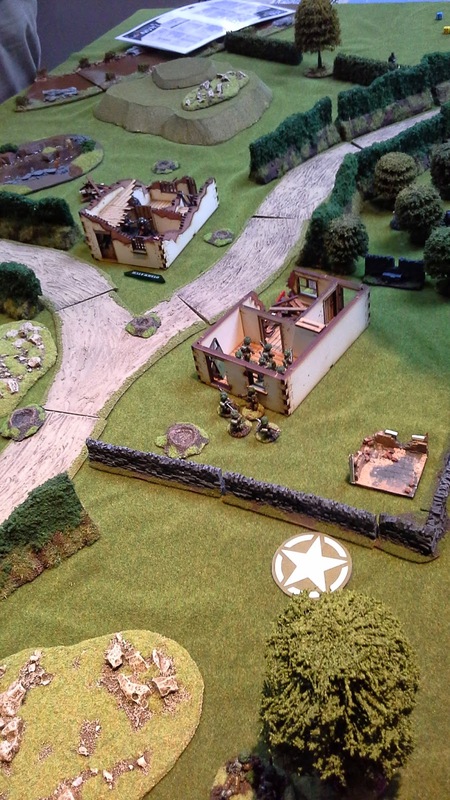 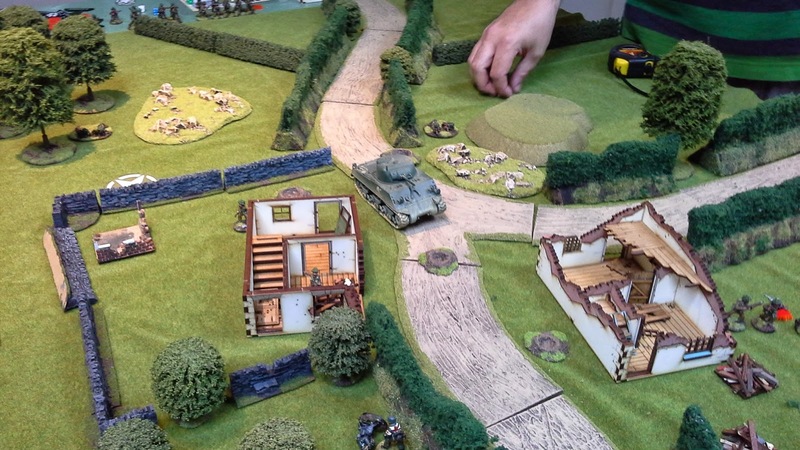 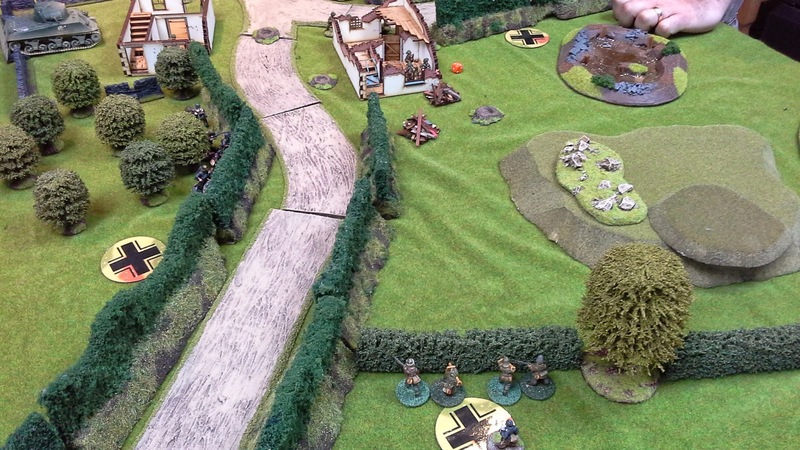 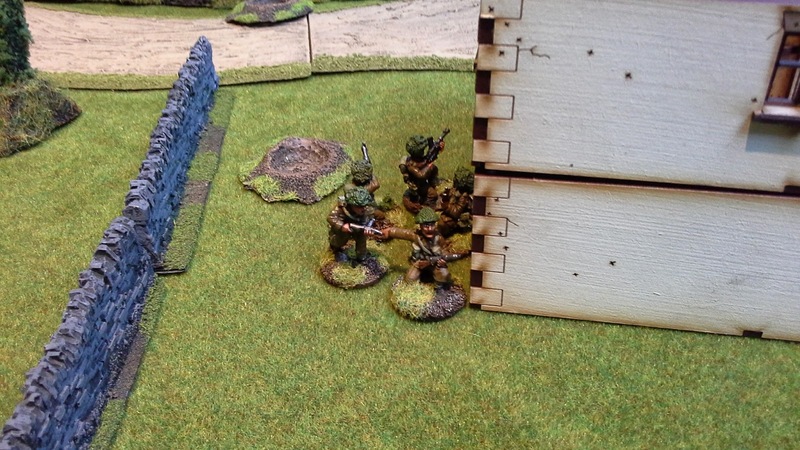 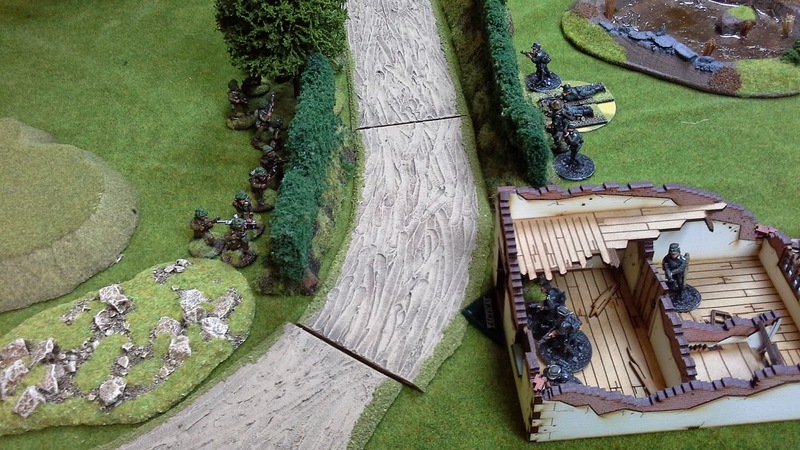 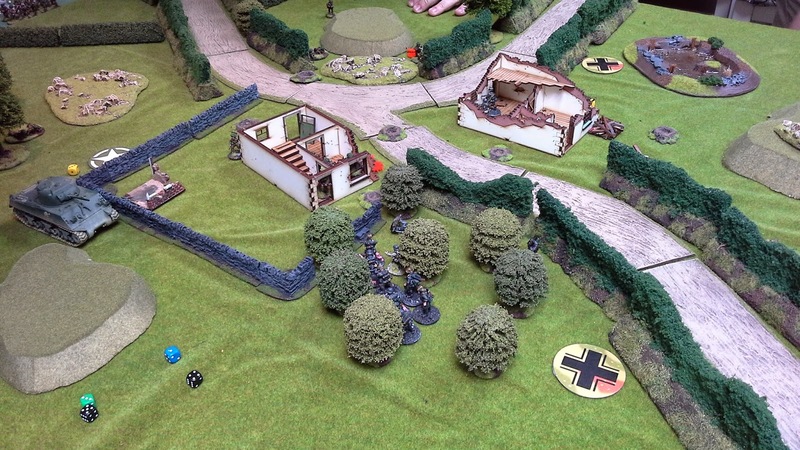 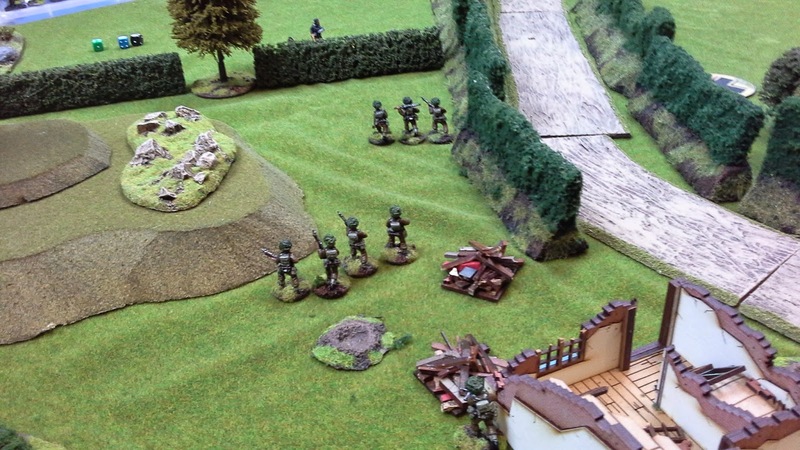 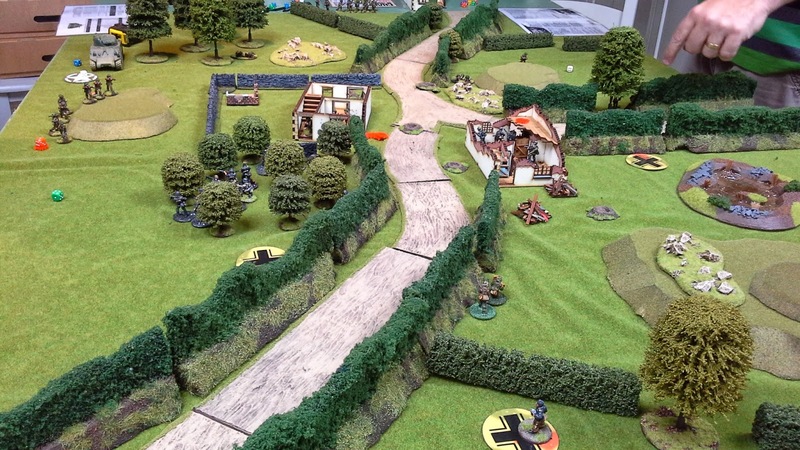 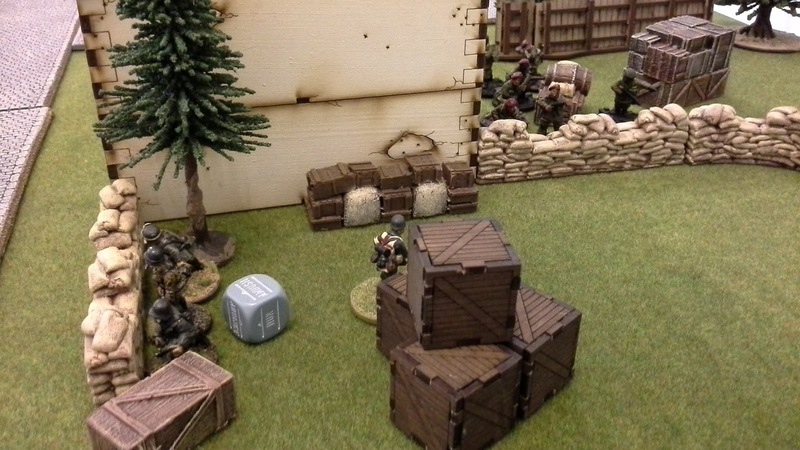 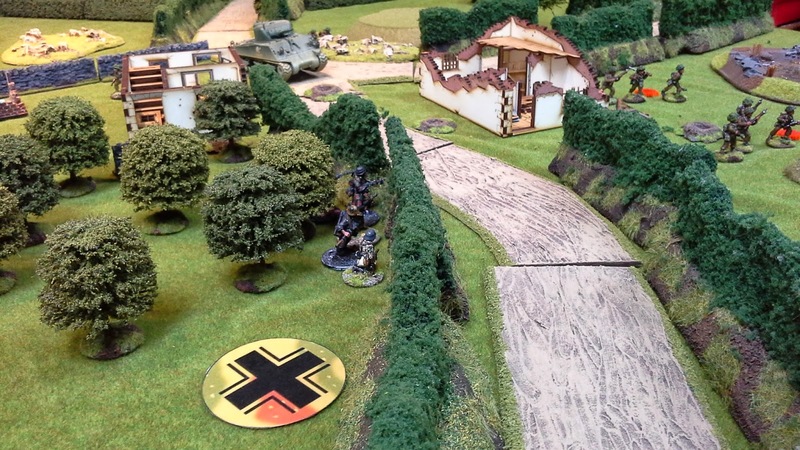 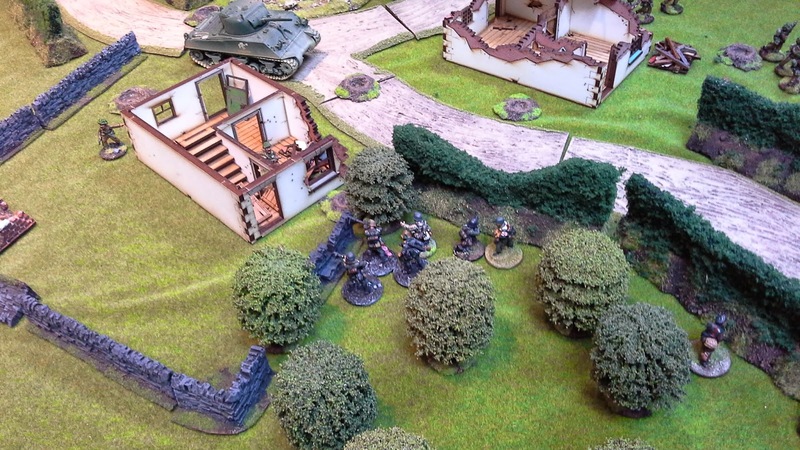 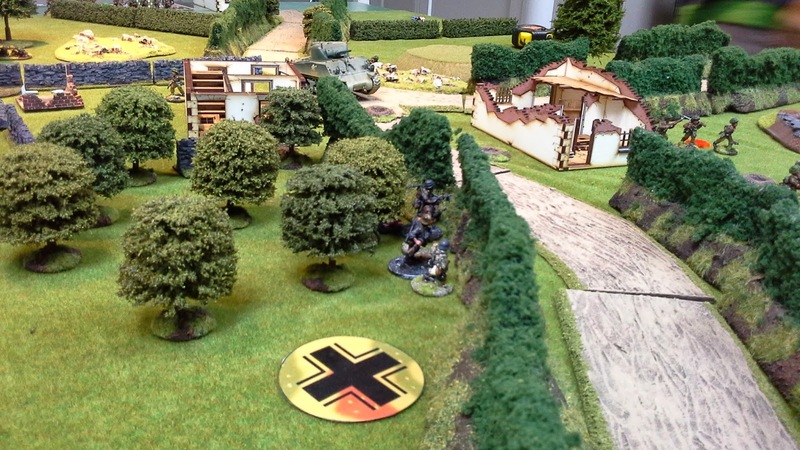 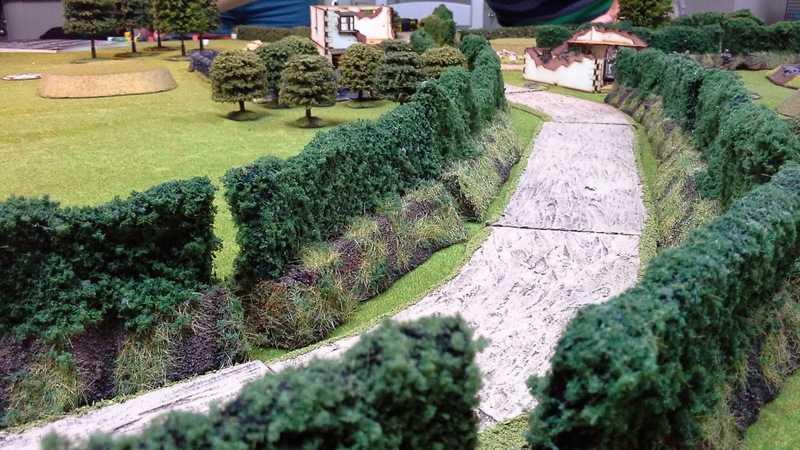 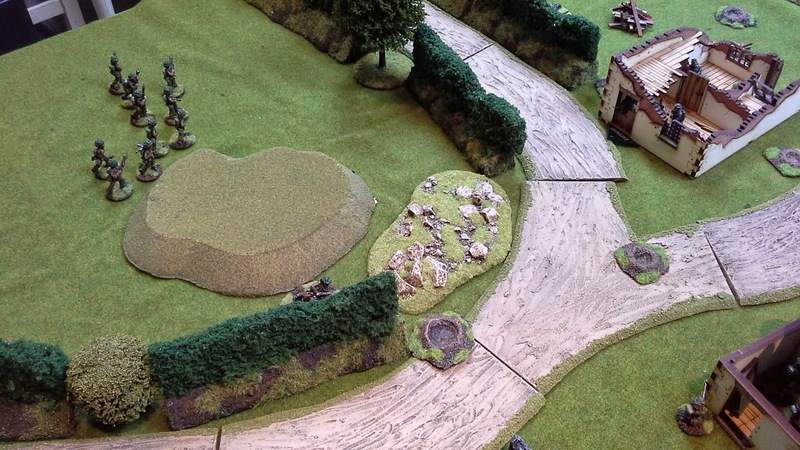 The Germans in the forest are now under fire from a tank and two squads! 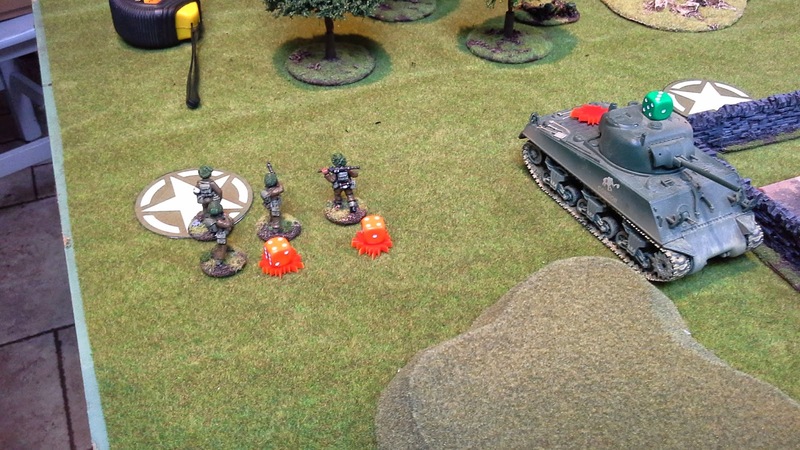 Back-up is on its way in the form of a panzershreck team. Buoyed by the destruction of the Germans at the bocage and the arrival of the Sherman, the plucky British first squad launch an assault on the Germans holding the ruined house. 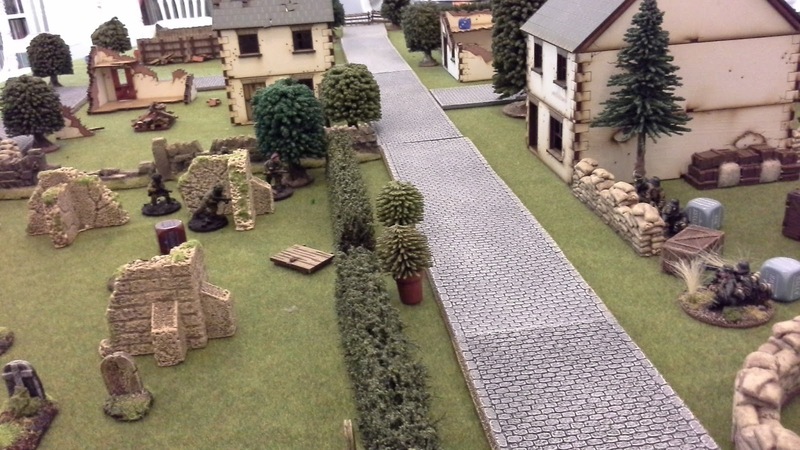 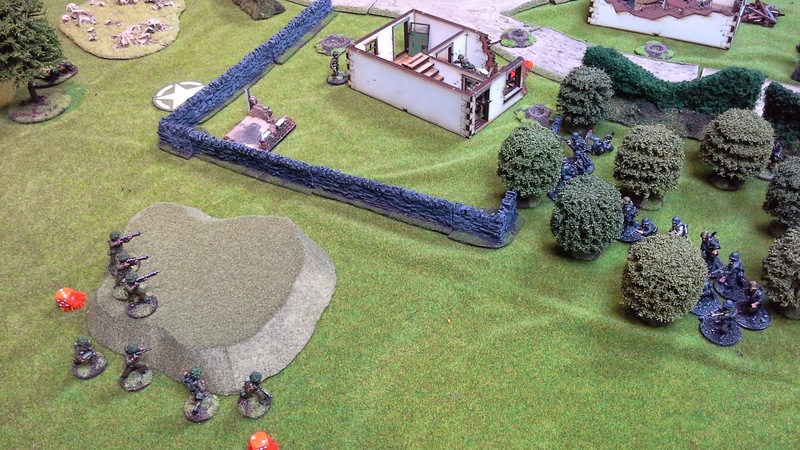 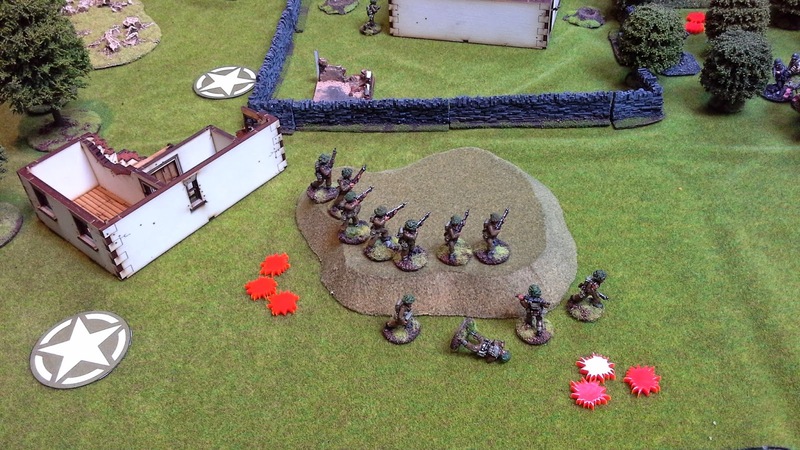 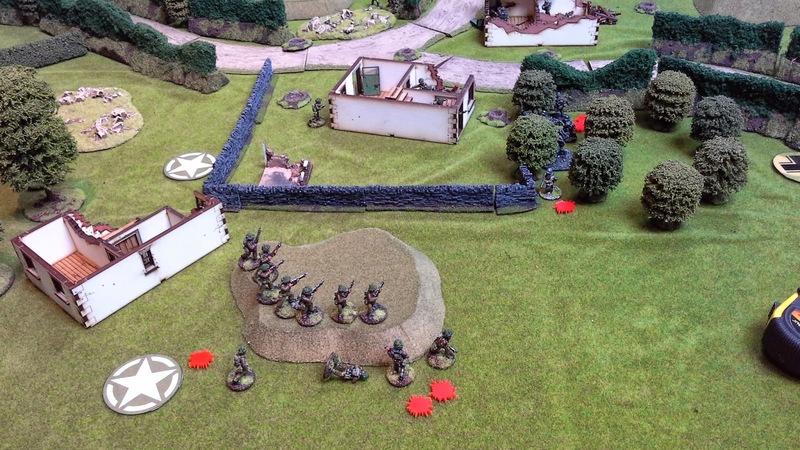 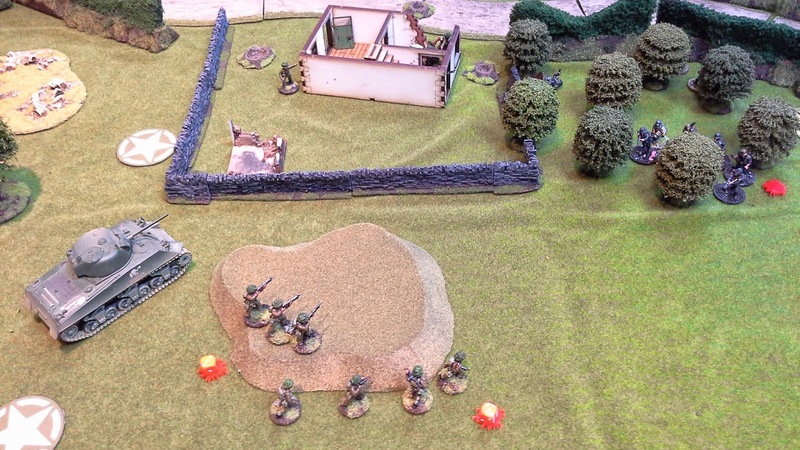 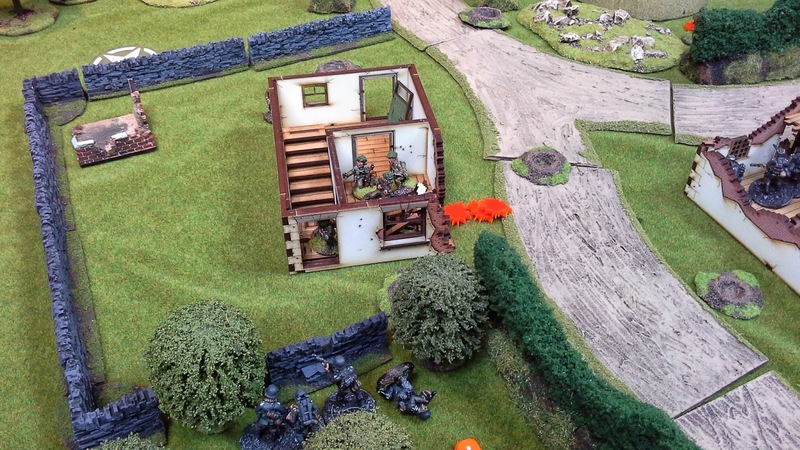 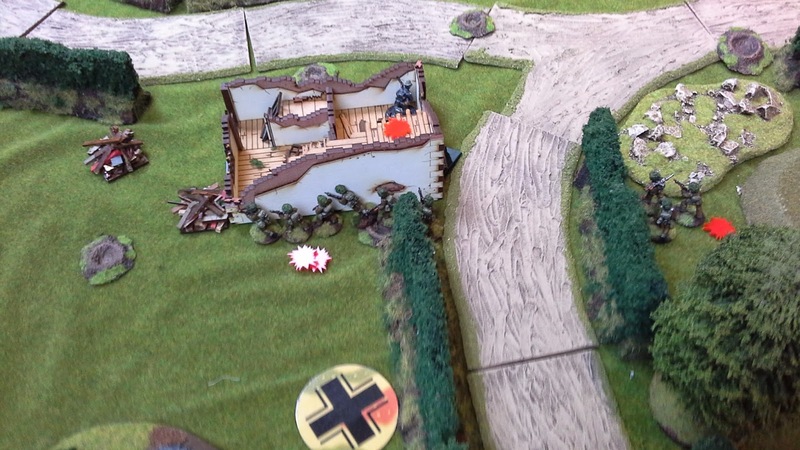 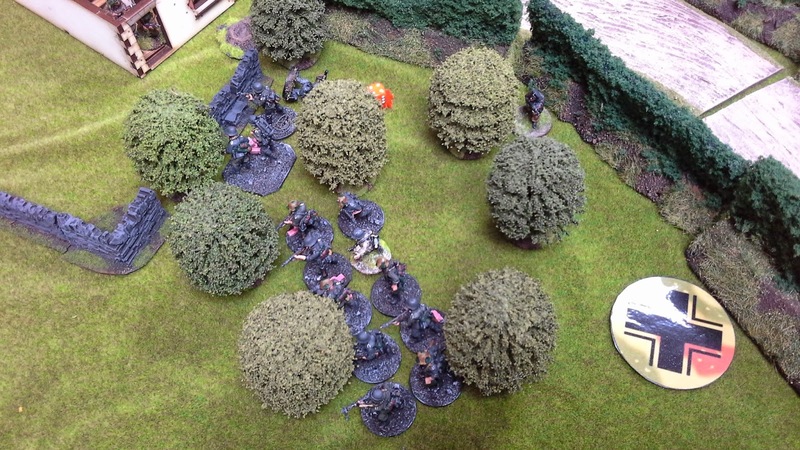 Grenades fly in all directions but the Brits get several hits on the cowering Germans inside! 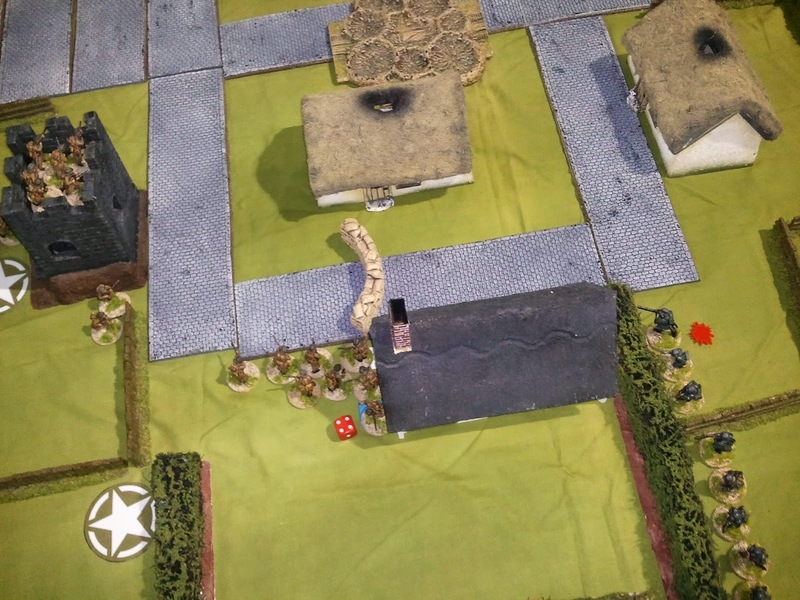 The tide is falling in the British favour on the other side of the battlefield too with the Germans struggling against the overwhelming force of the tank. 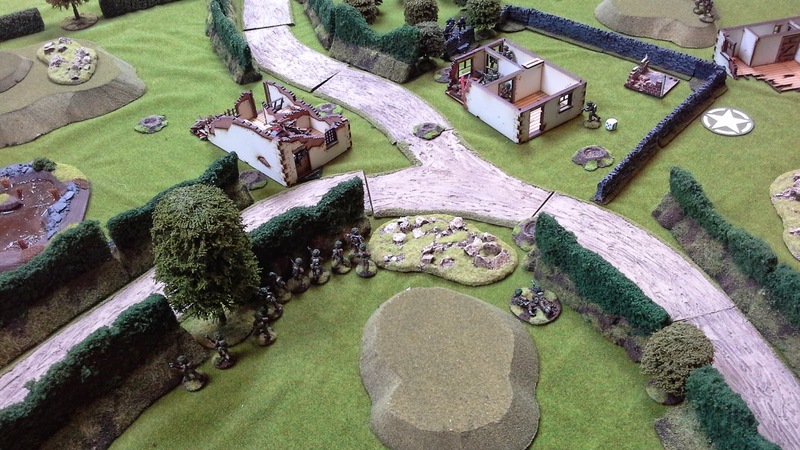 Despite this, the British squad on the hill have endured most of the German attack and when several of their comrades fall they decide they need to 'retreat and regroup'. 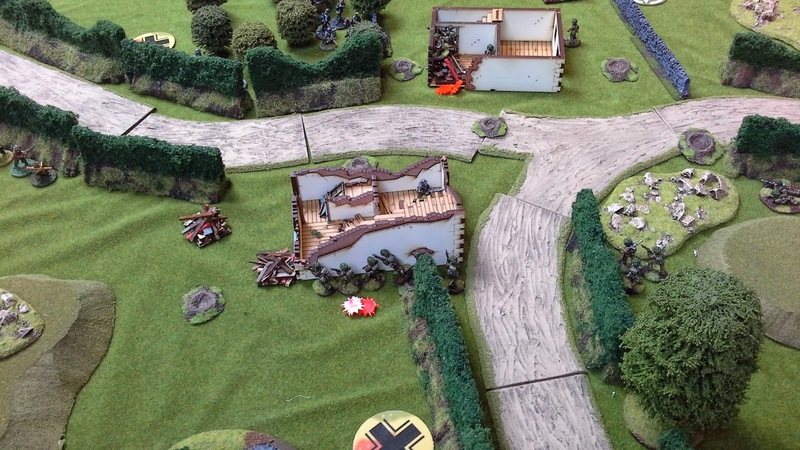 The attack on the house becomes a war of attrition and the Germans defenders are gradually whittled down to the lone Obergefreiter Drouse. 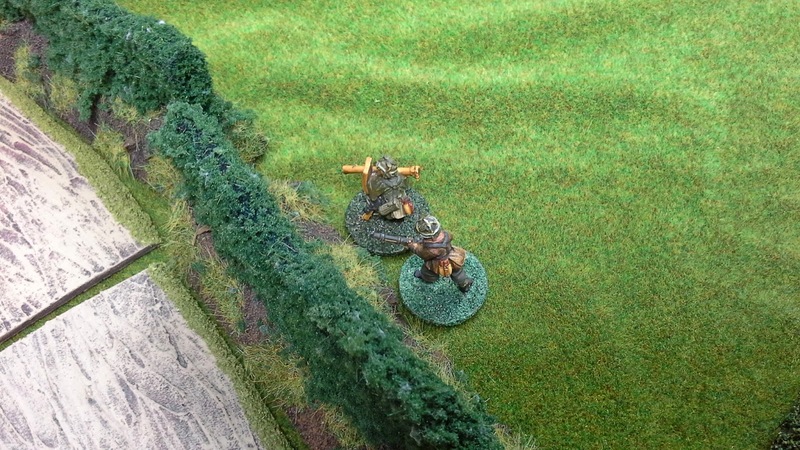 Eventually he too is felled despite some desperate hand to hand action. 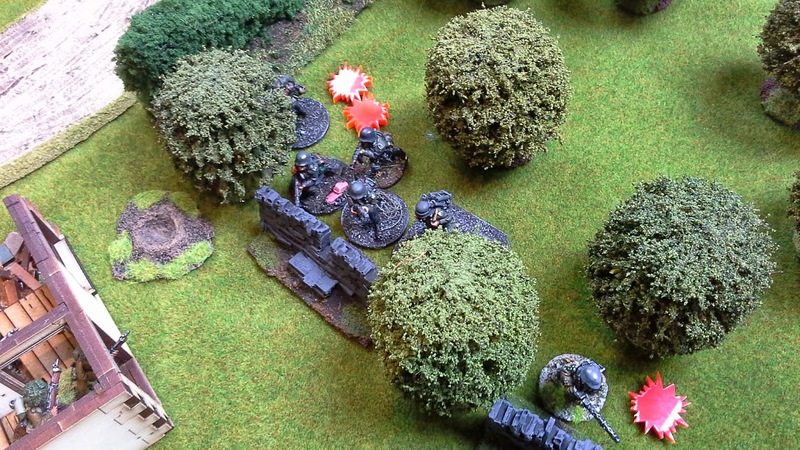 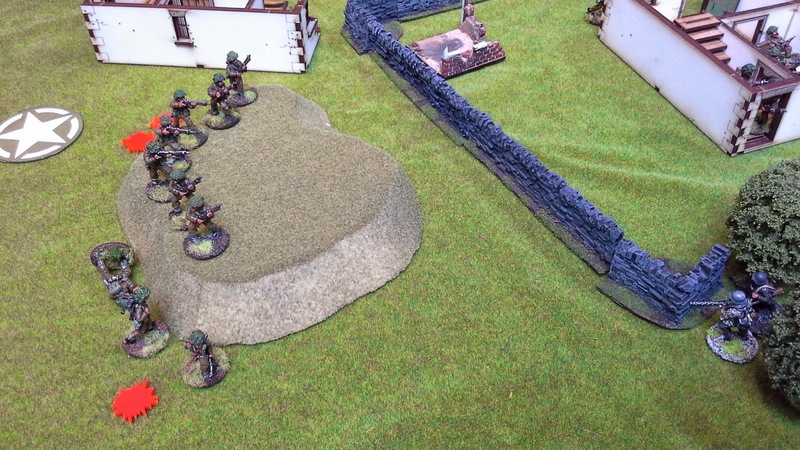 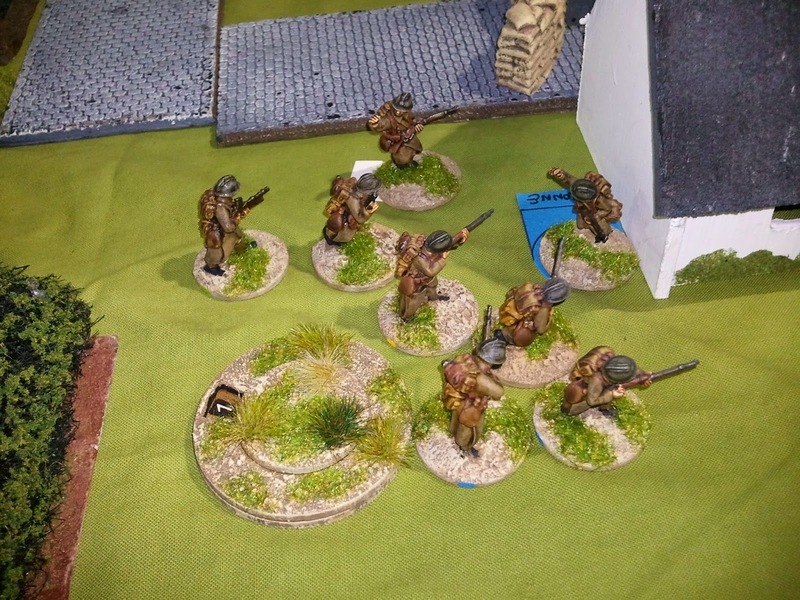 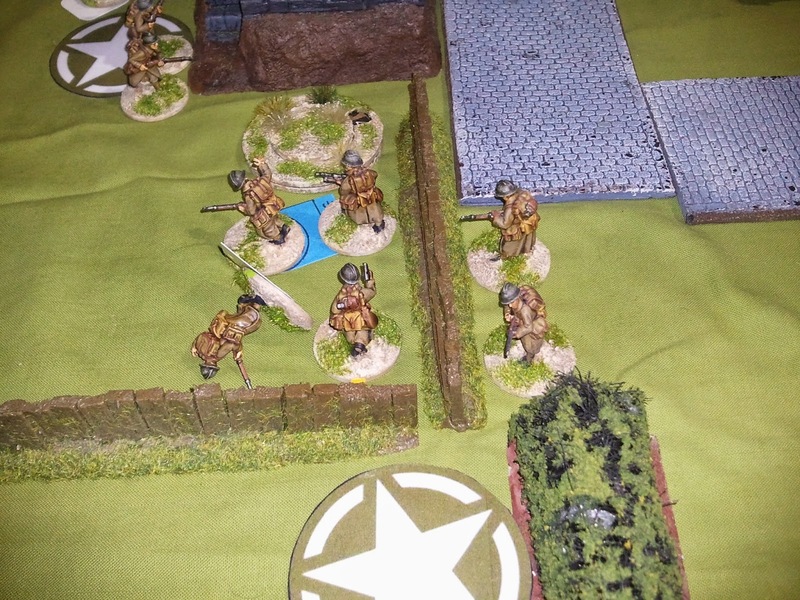 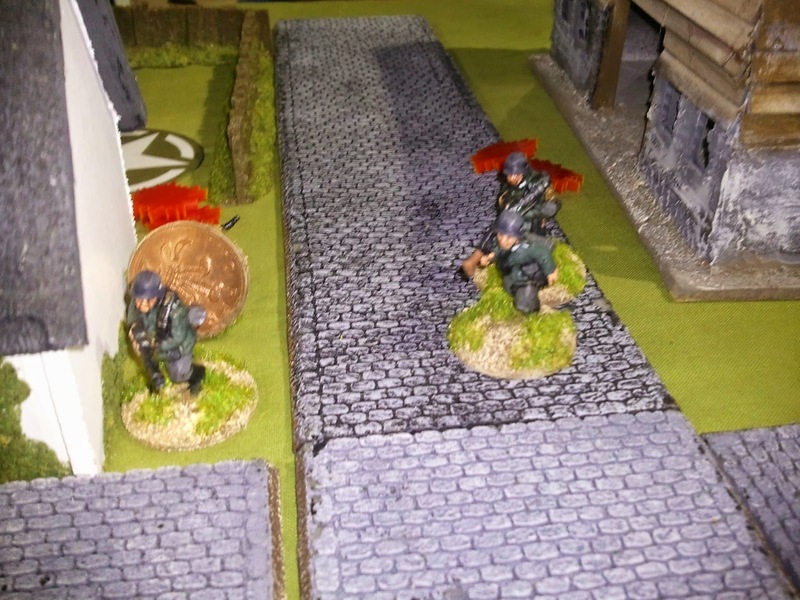 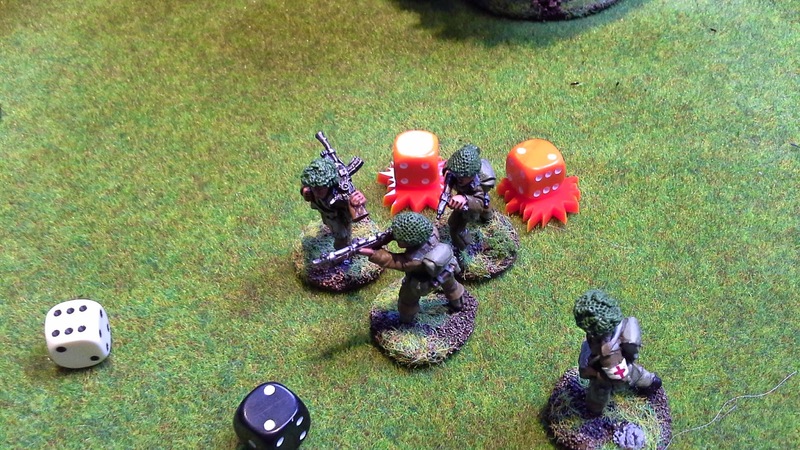 The Germans cannot bring their two panzerschreck teams to bear and both fall back. 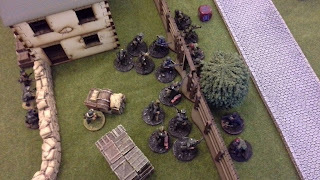 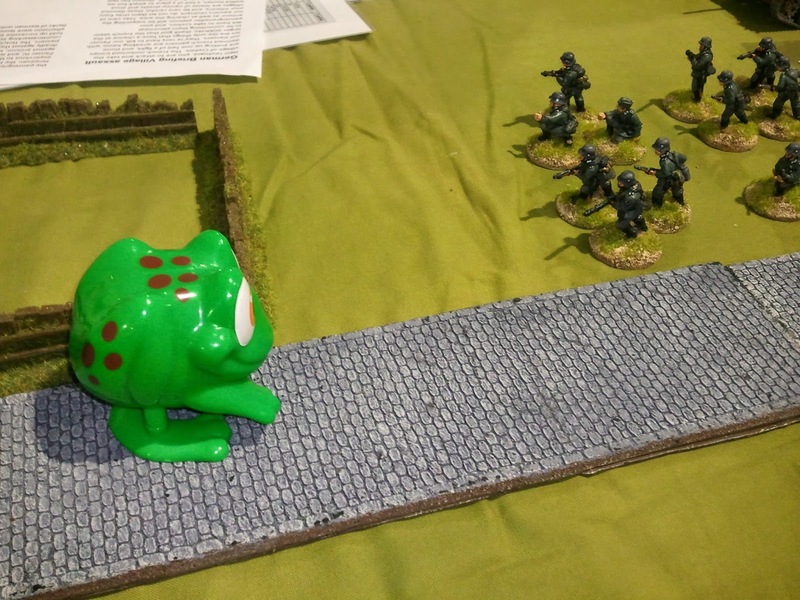 ...the situation looks bleak and they start to retreat. 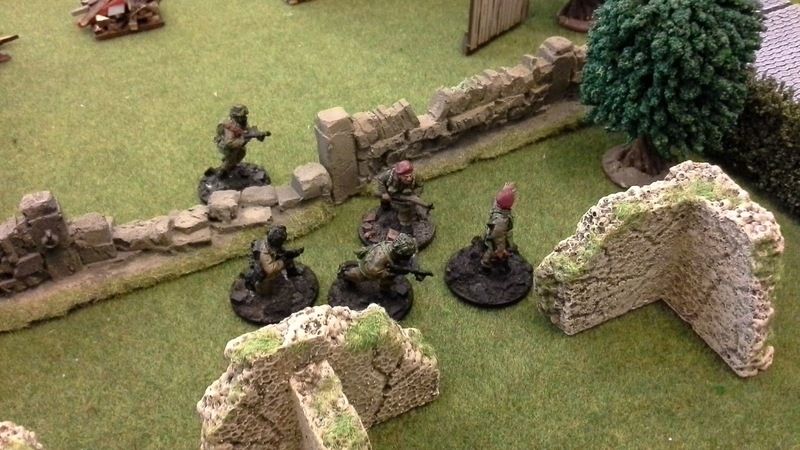 A cry of "C'mon lads, up and at em!" 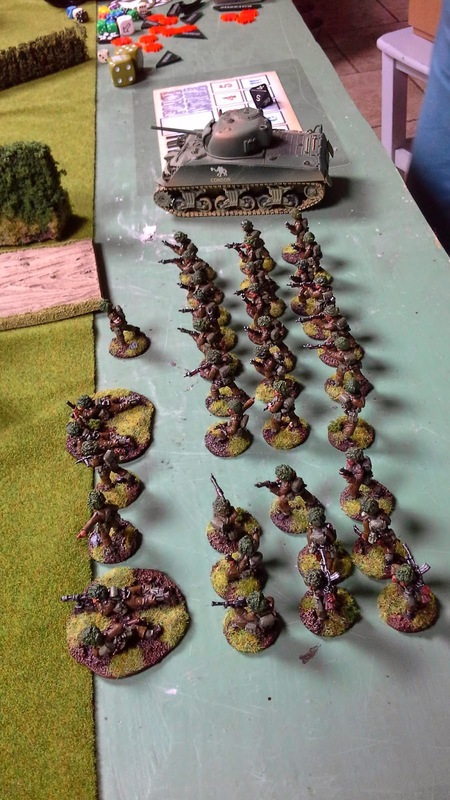 rings out and the British first squad under Sgt. 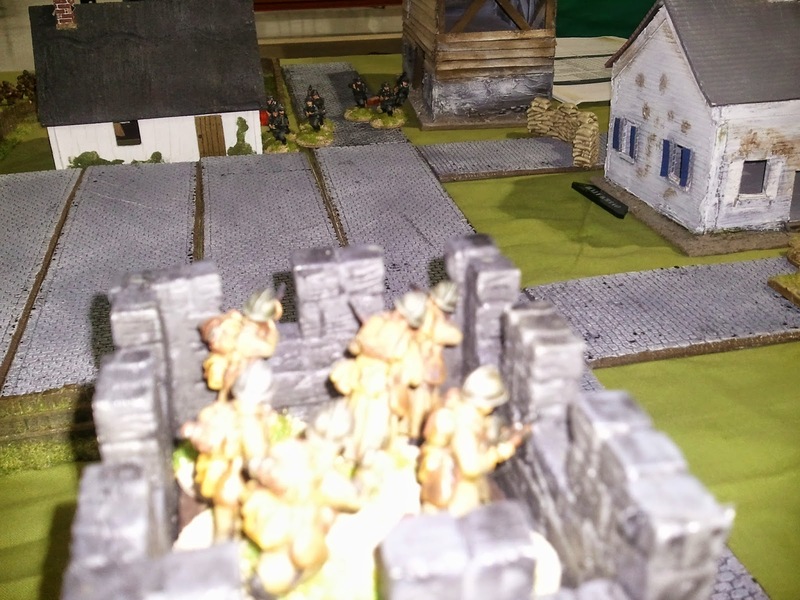 Mills lead a heroic charge at the last German defensive line. 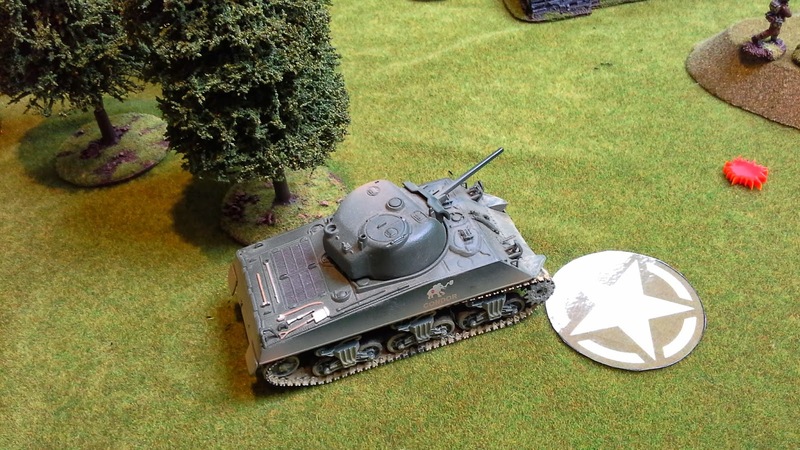 The Sherman is not far behind and effectively cuts off the road, stopping the surviving Germans from the forest retreating to join their comrades. 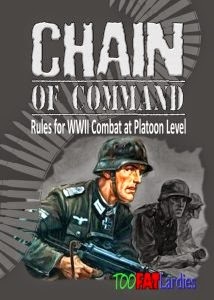 They decide to move back and assault whoever remains at the farmhouse...which happens to be the battle hardened Captain Robertson and Platoon Sgt. 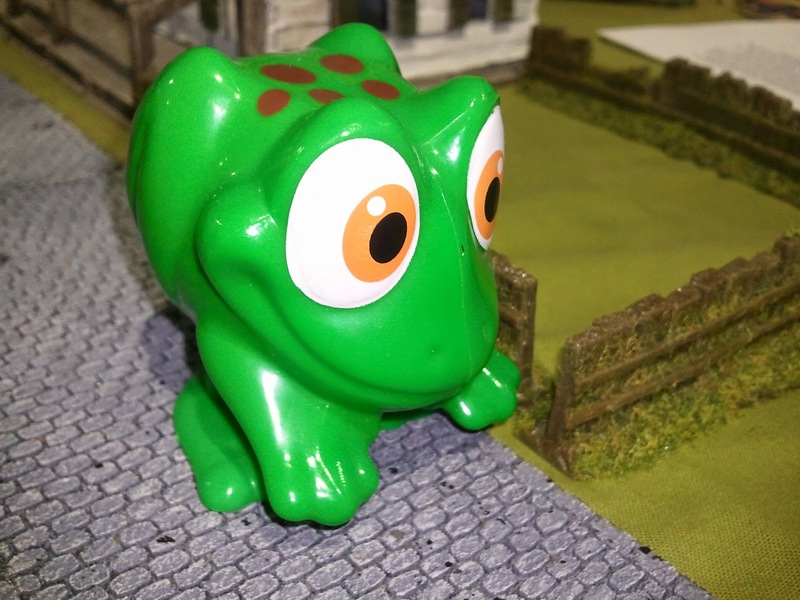 Harris! 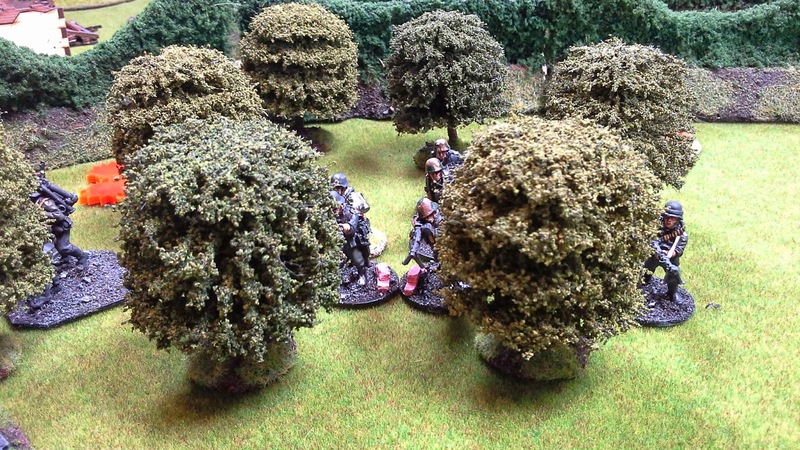 Meanwhile, the attack on Captain Robertson and Platoon Sgt. 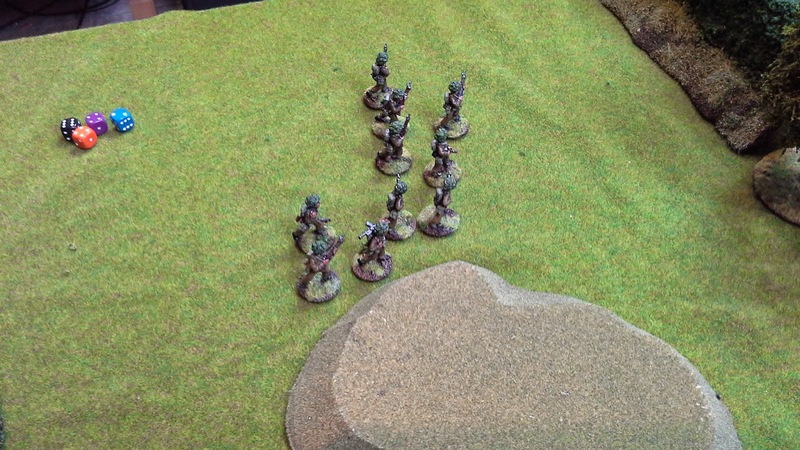 Harris ends in hand to hand fighting and complete slaughter. 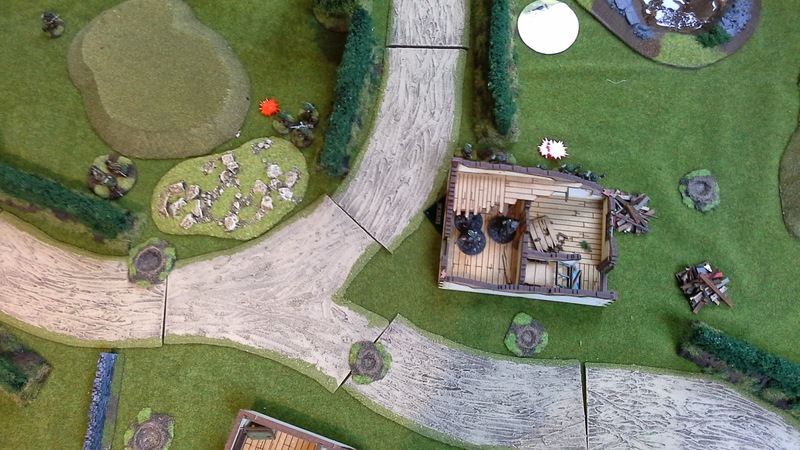 Only the brave Captain remains alive, although unconscious! 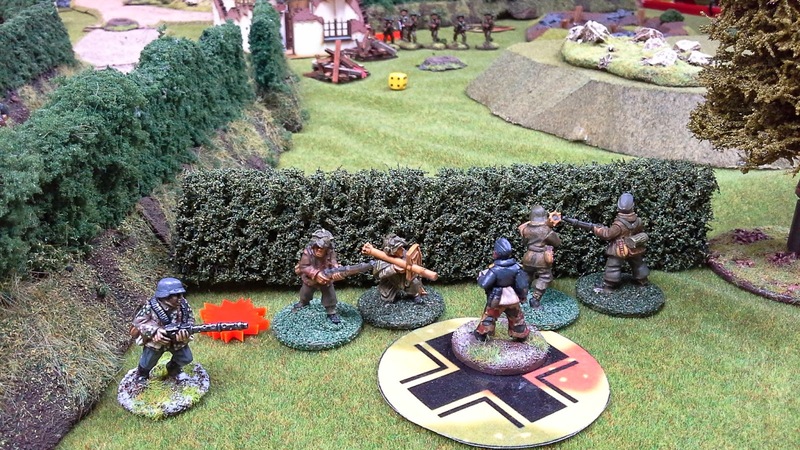 The Germans are reduced to one shocked man holding a panzerschreck and Hauptmann Matz. Their morale is obliterated. The medic sees to the British wounded. 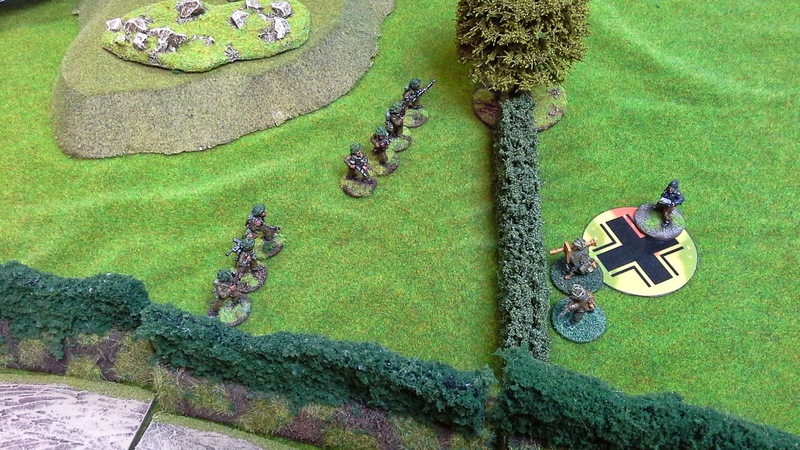 Things almost panned out as near to a draw as you can get but ultimately the Germans moral crumbled at the end. 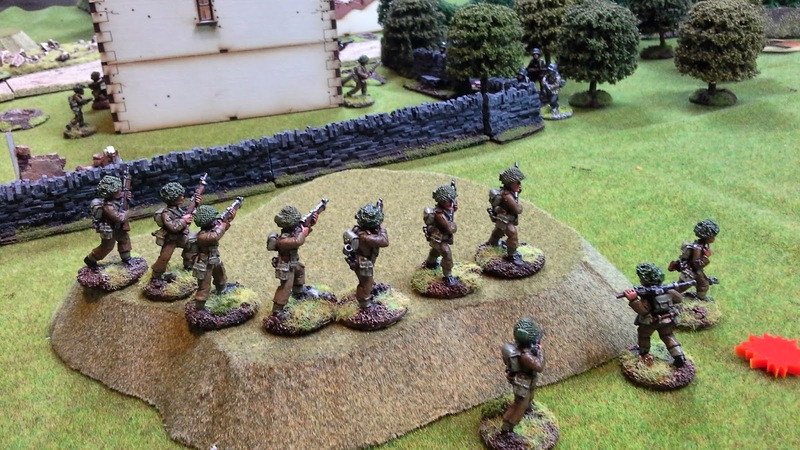 Despite this they had held the British back and delayed them significantly. 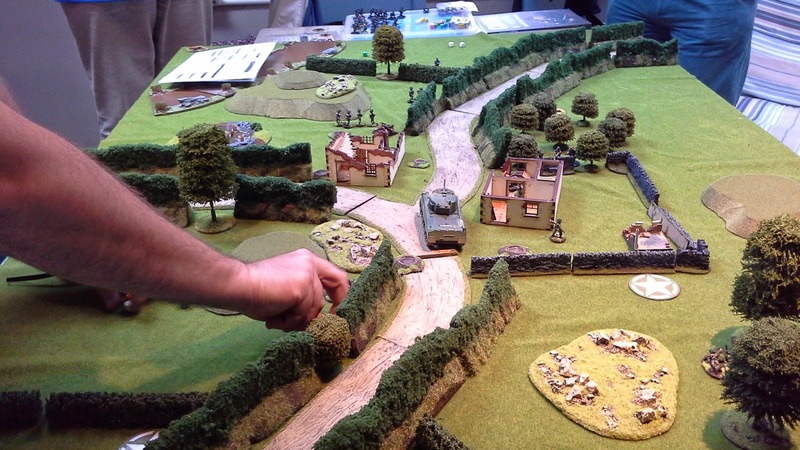 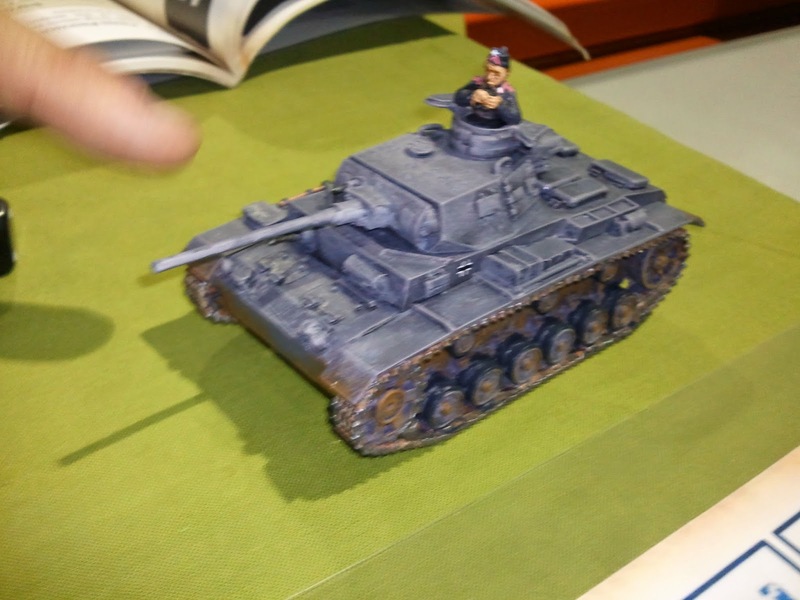 The British probably were the clear victors as they still had a tank and a reasonably healthy squad. 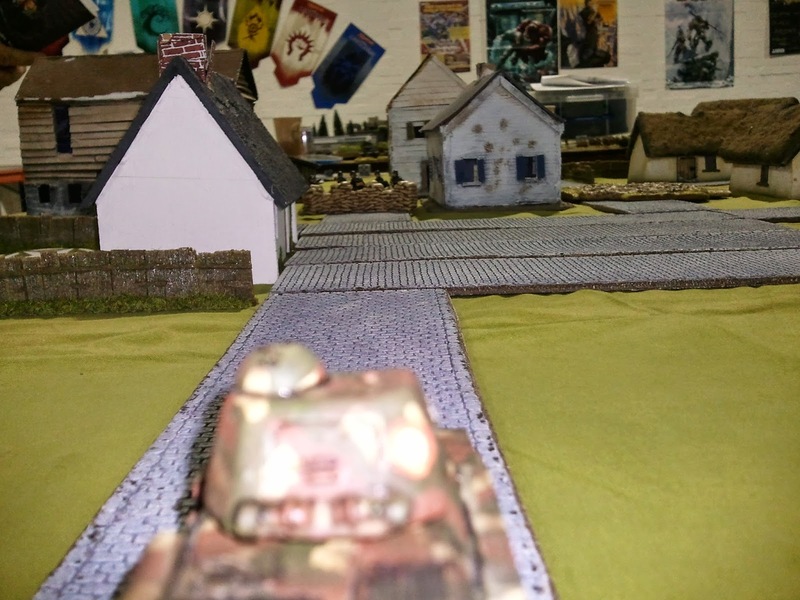 The Jerry were reduced to pretty much a Junior Officer (Hauptmann Matz) and one rather shocked panzershreck man! 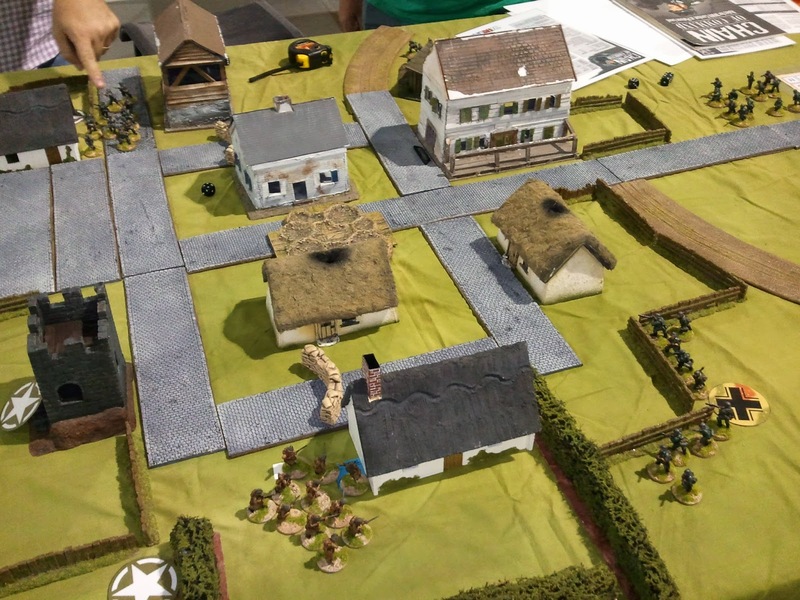 Another great game - we probably procrastinated and the battle took the whole day but with a few more games under our belts (and maybe more regular play) it should start to all come together. 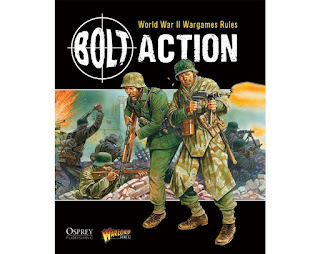 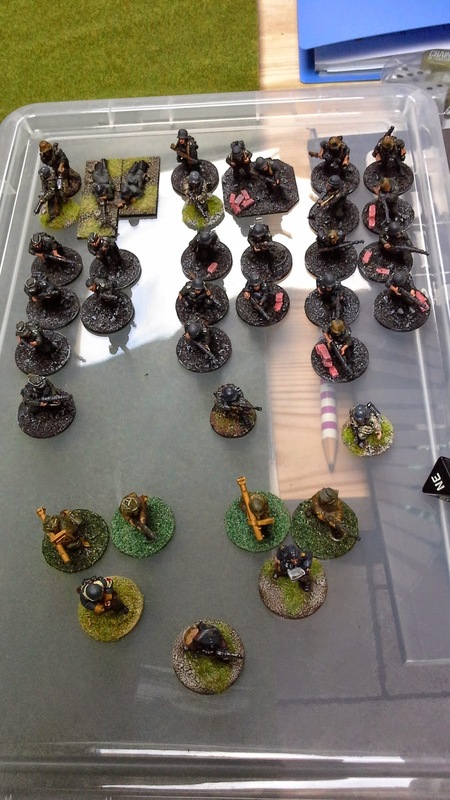 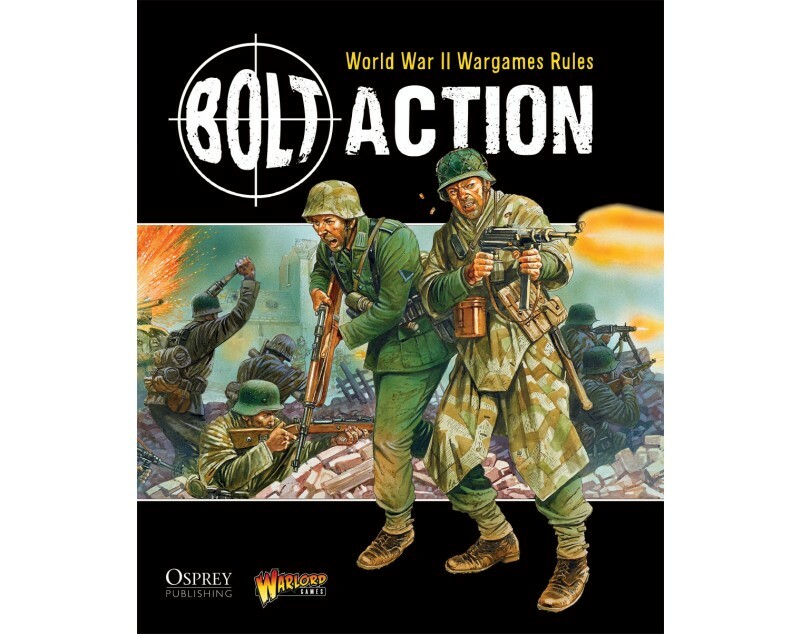 Figures are a mix of Bolt Action, Black Tree, Crusader and Artizan belonging to Andrew and myself.